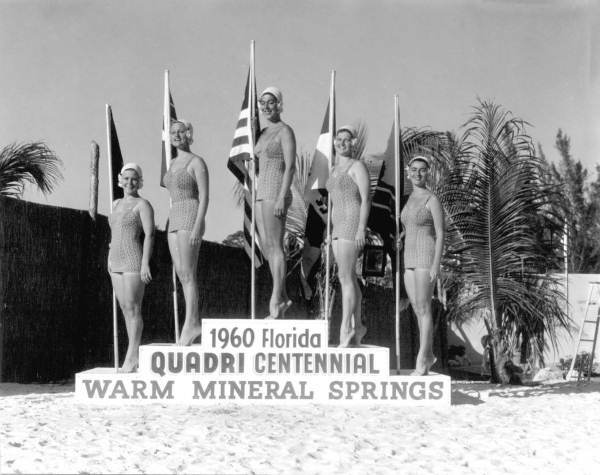 A fountain of youth conjures images of a tranquil pool full of bathing beauties in a tropical setting. There’s a place in North Port, Florida, just like that. Except swap out the bathing beauties for plump, septuagenarian Eastern Europeans wearing hats the size of garbage can lids. 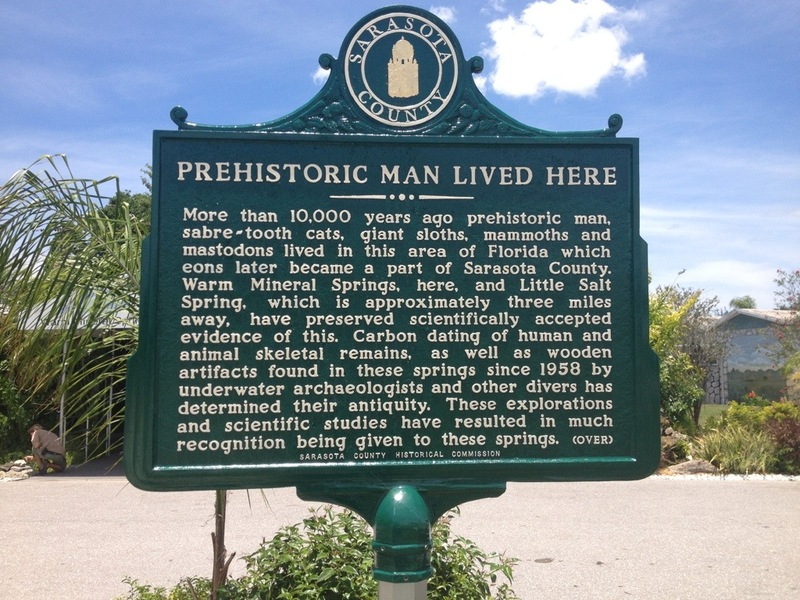 Also, add the smell of rotten eggs and a bunch of ancient American Indian bones at the bottom of the pool, and that’s it: Warm Mineral Springs. 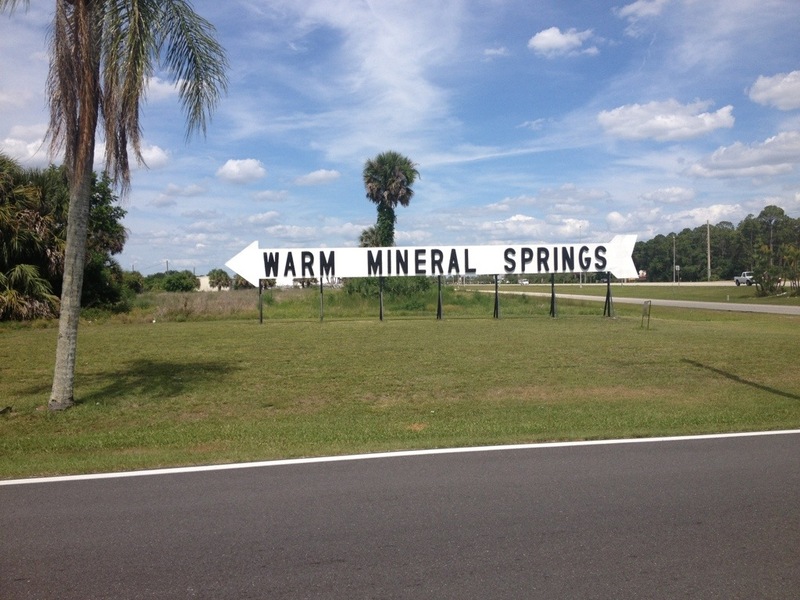 The Warm Mineral Springs Motel stands along the Tamiami Trail and acts as the unofficial gateway to the springs. 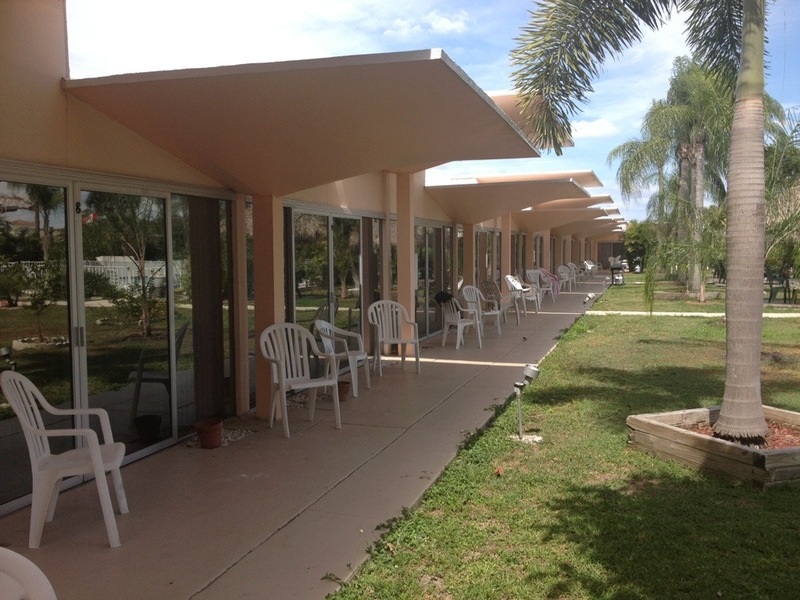 The buildings, designed by Sarasota modern architect Victor Lundy and built in 1958, are laid out like a typical postwar motel complex with the one-story buildings forming a U-shaped courtyard. 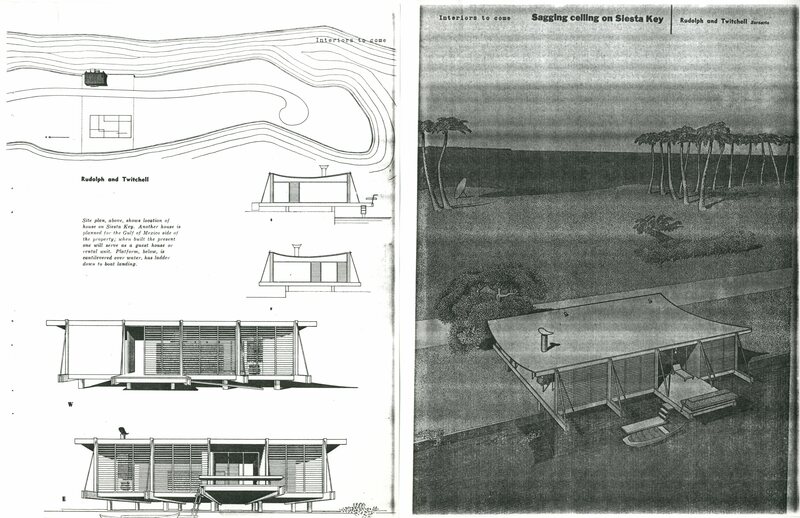 But Lundy, the most artistic of the Sarasota School architects, brought some flourish to the arrangement with his dual-level concrete roofs that resemble giant square golf tees. The expansive sliding glass doors encourage guests to hang out in the courtyard, and that’s what the few there were doing when I visited. 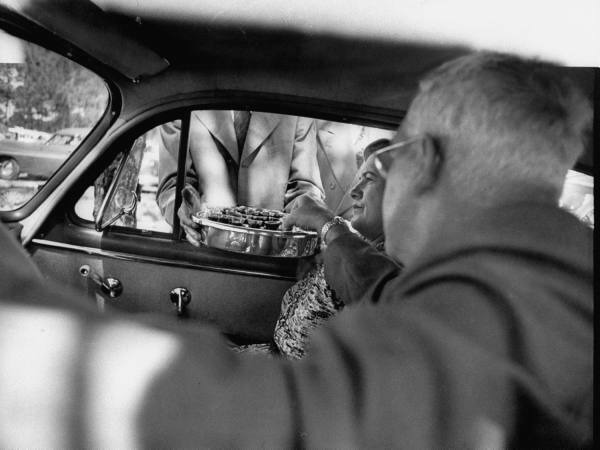 Unlike those in most postwar motels, the patrons appeared to be neither drug addicts nor the recently paroled. 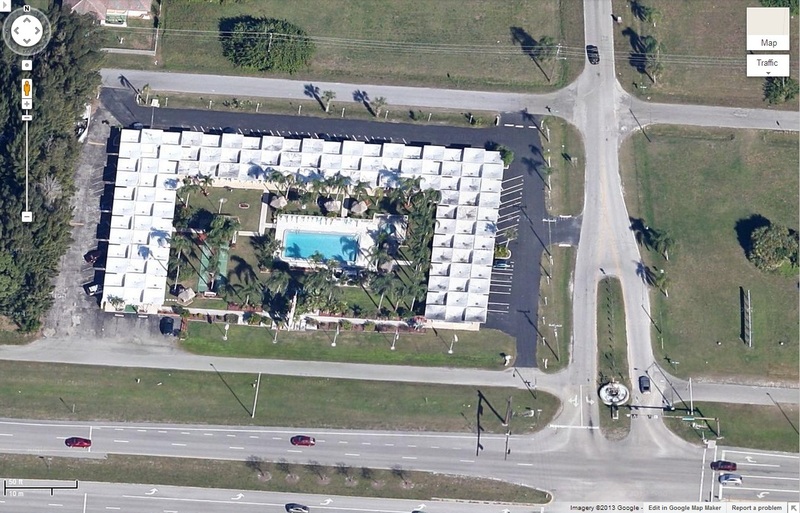 Google aerial of the Warm Mineral Springs Motel and its unique roof(s). 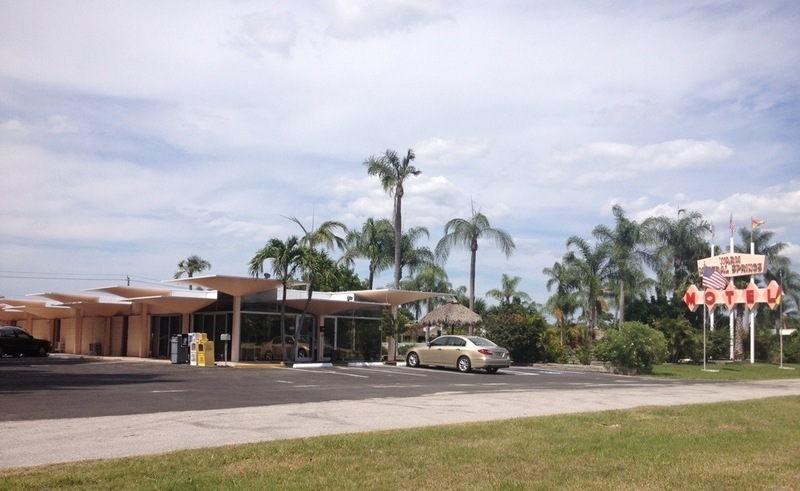 Warm Mineral Springs Motel office. Doors open wide to encourage a connection to the courtyard. Airy dancing girls in a non-functioning fountain along the Tamiami Trail. 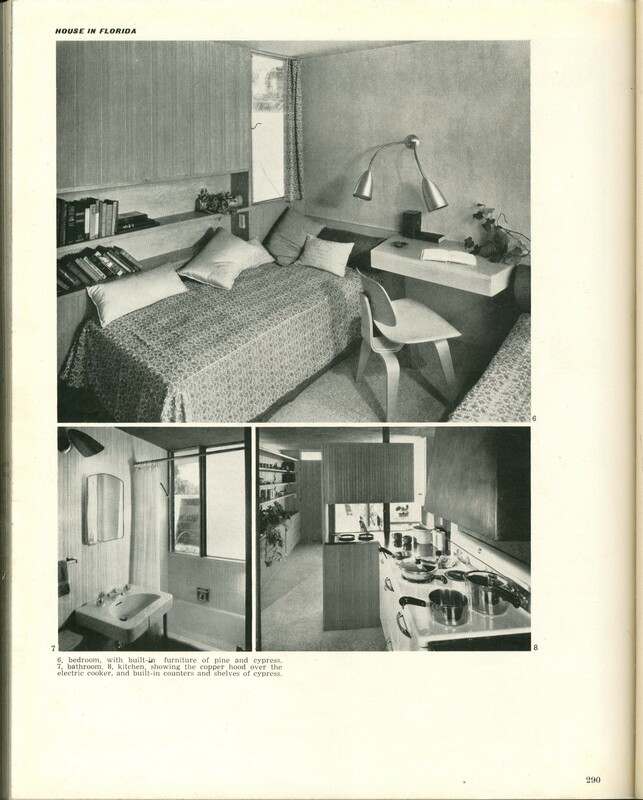 Click here for historic images of the motel. The springs are about a mile north of the motel. 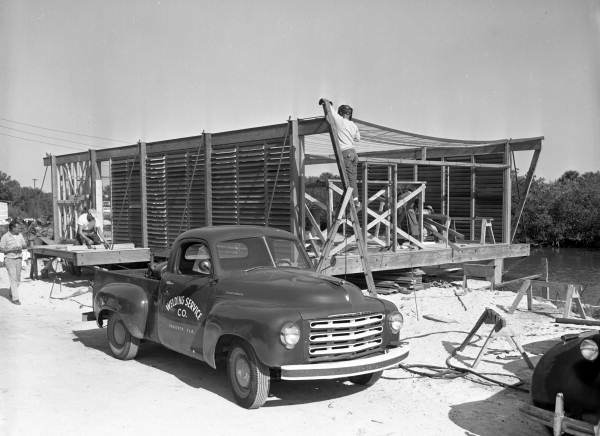 The route passed through a half-developed subdivision that showcased the evils of sprawl. Lots first put on the market 50 years ago still sat empty. 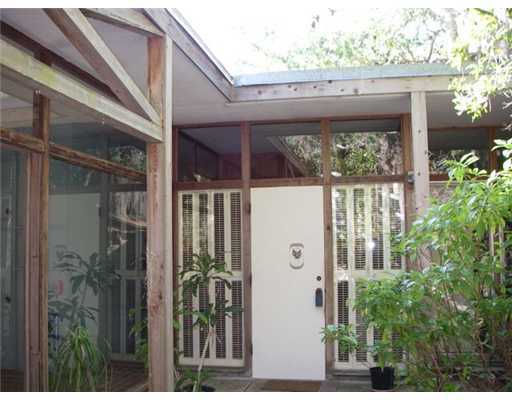 Those that have been improved featured the state’s finest uninspired residential designs from the 1960s through the present. Trees were height challenged, and the grass was about as thick as Matt Lauer’s hair. This abandoned building in the subdivision probably once housed a business. 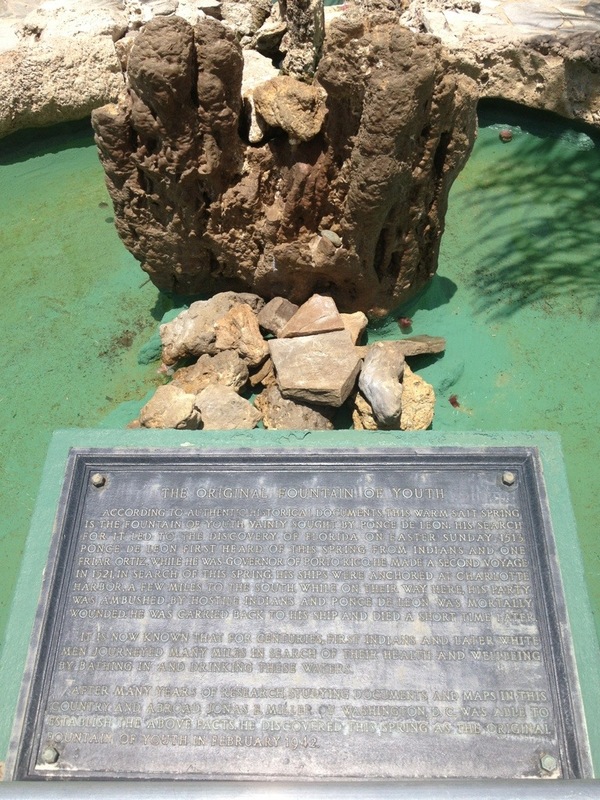 A tile slab outside the springs complex commemorated the 400th anniversary of Tristan de Luna’s settlement of Pensacola , the first in La Florida. De Luna actually landed in 1559, so apparently they thought the event worthy of a two-year celebration. 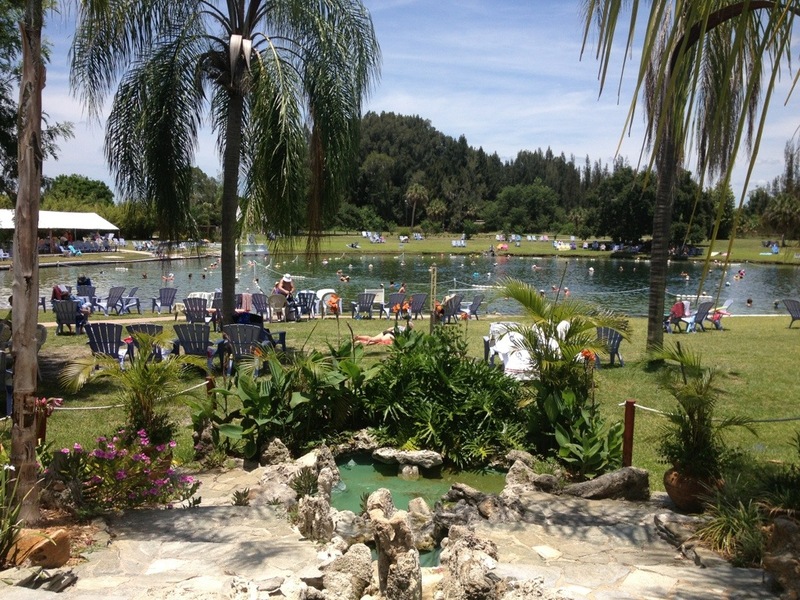 Warm Mineral Springs is a strange place to celebrate de Luna’s landing considering Pensacola is about 300 miles away. This year, Florida is all about the 500th anniversary of Ponce de Leon’s voyage to the state’s east coast, so de Luna’s later date has lost its luster. 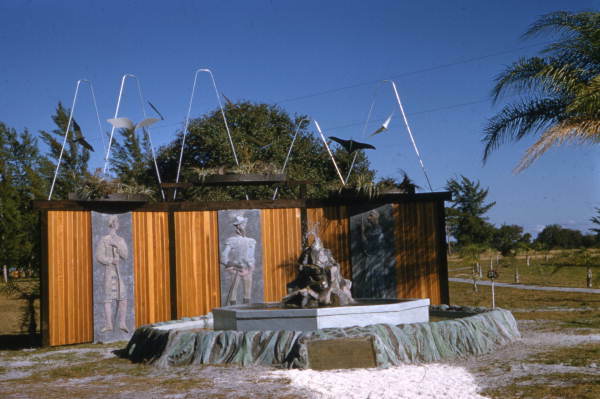 Jack West, another architect who was part of the Sarasota School of Architecture, designed the facilities at the springs, which include a gift shop, bathing house, restaurant, and cyclorama depicting Ponce’s “discovery” of the fountain of youth, rumored to be Warm Mineral Springs. Unfortunately, the cyclorama was closed, and the cold-hearted employees wouldn’t let me in despite my pleas. 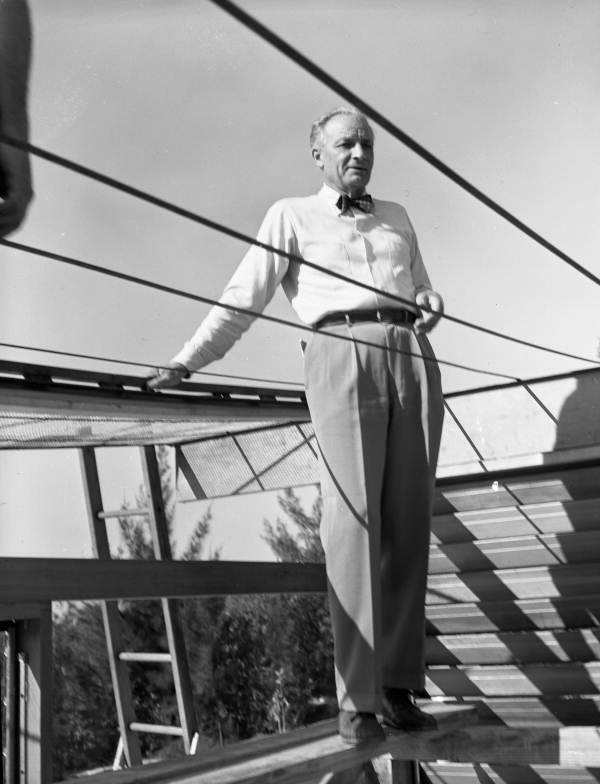 West’s buildings are utilitarian, but he wisely utilized long, narrow corridors to build anticipation before visitors reach the springs pool. Dear Fiancee poses at the entrance. 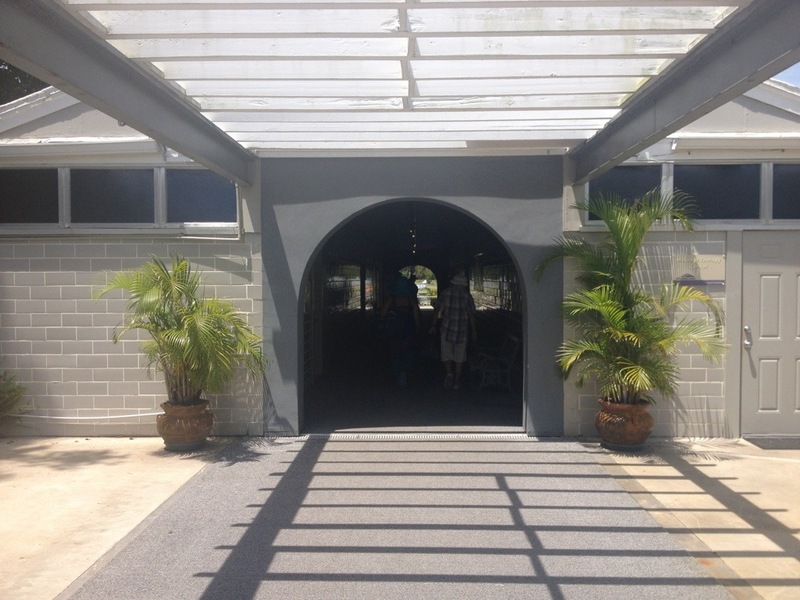 Arched hallway bathhouse and changing rooms builds anticipation before opening at the springs. I’m sure he was their first choice. 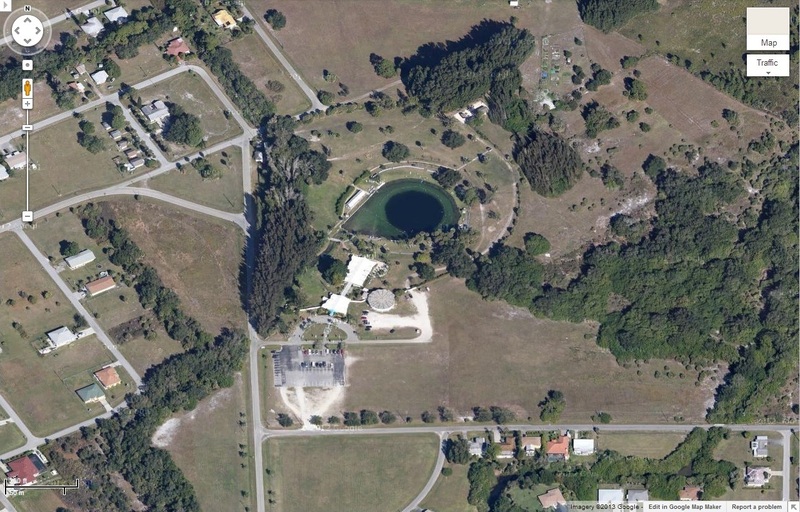 Google aerial of Warm Mineral Springs. The tunnel opened to a lush setting, a contrast to the neighborhood just across the fence. Colorful plants and a small fountain with a plaque greeted us. The circular pool is about 240-feet wide and is drained via a creek in the southwest corner. Waders walked in a clockwise motion along the perimeter as if they were performing a ritual. Soothing instrumental music played over the sound system. A few people swam leisurely across the middle. 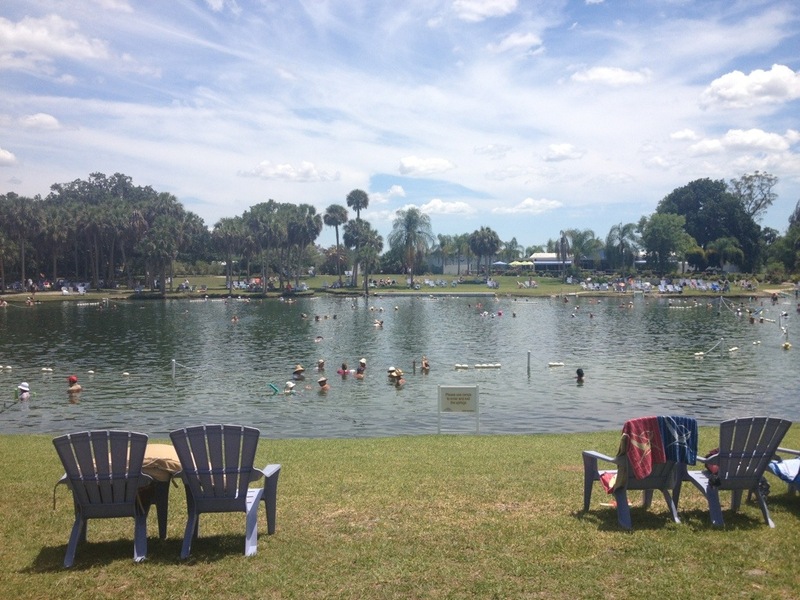 Random groups of plastic lounge chairs rung the perimeter of the swimming hole. 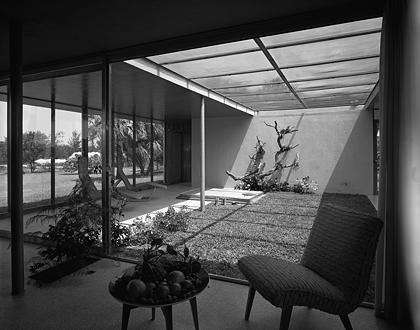 Shade was offered by a tent to the west and the stands of palm and oak trees to the east and south. Voices speaking unfamiliar dialects were common. It’s surprising that the springs attract patrons from so far away considering North Port is about as cosmopolitan as an Olive Garden. Nonetheless, many have relocated to the area from the Baltic Sea region so they can swim daily in hopes of curing their ailments. The 86-degree water is supposedly packed with dozens of minerals, including hydrogen sulfide (thus the bad smell). Eight million gallons of the water–estimated to be 30,000 years old–shoots up from the Earth’s crust every day. Surprisingly, Dear Fiancee wanted to go in the water with me. Here it comes, I thought, one step into the muck and she’s done. But there would be no muck, because sand had been dumped on the bottom, and the slime was limited to the tops of the toe-stubbing limestone outcroppings. The water is only a few feet deep along the perimeter of the pool. But past the ropes it drops to a depth of about 210 feet. Shaped like an hourglass, the basin was a partially submerged sinkhole thousands of years ago. Prehistoric American Indians buried their dead along the sides in small caves before it filled to the brim, and the National Register of Historic Places-listed WMS is one of the most significant archaeological sites in the United States. 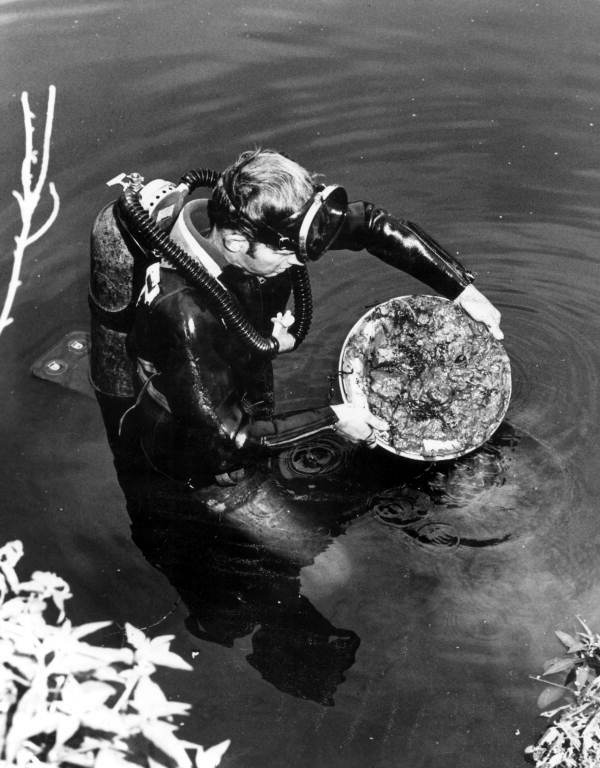 In 1976, divers found a mandible that was carbon dated to about 10,000 years ago–among the oldest human remains found in North America. The sinkhole also may have been an inescapable pit, and bones from humans–as well as extinct animals such as giant ground sloths, sabertooth cats, and wooly mammoths–have been found at the debris cone at the bottom. 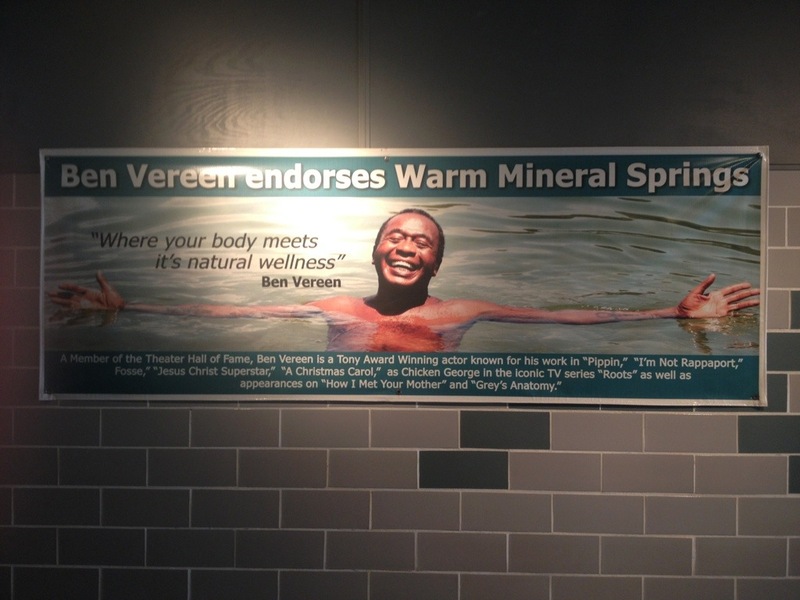 The mineral water acts as a preservative for the bones. As we swam to the middle, Dear Fiancee asked about the possibility of alligators. I halfheartedly assured her that alligators don’t like mineral baths. I was more worried about an attack from the ghost of a dead American Indian, angered that his sacred burial place had been infiltrated by Nikita Khrushchev lookalikes floating on foam noodles. If it’s engraved on a tablet, it must be true! Water from the spring pool exits via this creek, which extends to the Myakka River. 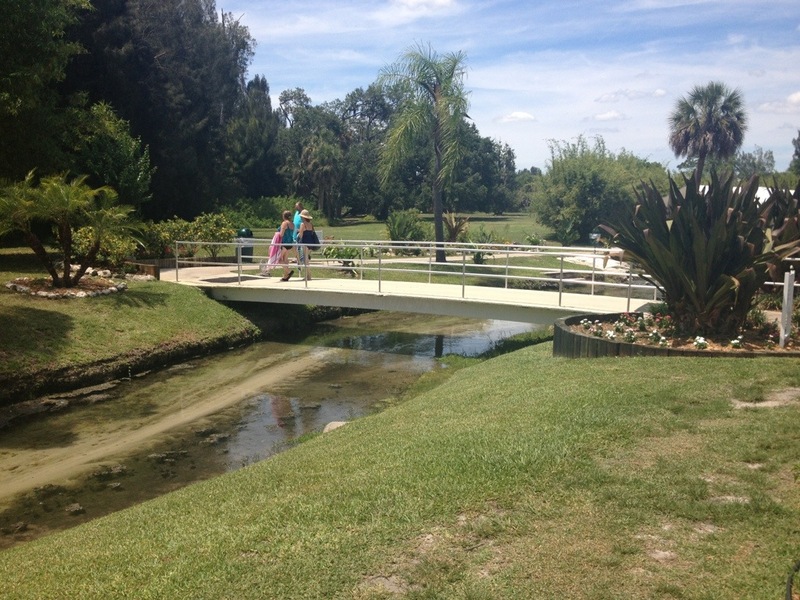 Sarasota County and the city of North Point are playing tug of war over the springs’ future. 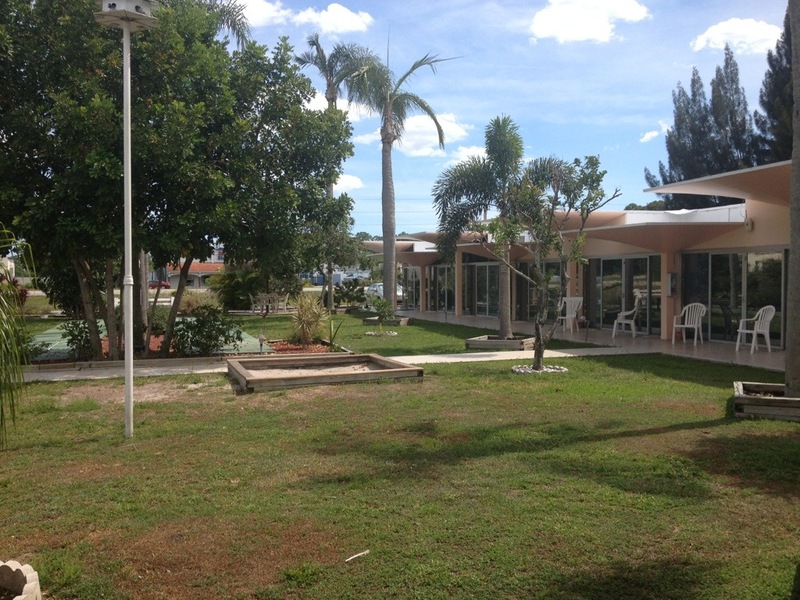 The two municipalities jointly purchased the property in 2010 for $5.5 million. They hired the former owner to manage it as a health spa, which includes yoga, massage therapy, and acupuncture. Going forward, the county wants a developer to build a health resort with shops and condos and a medical plaza, assisted-living facility, and hotel on the empty land near the springs. 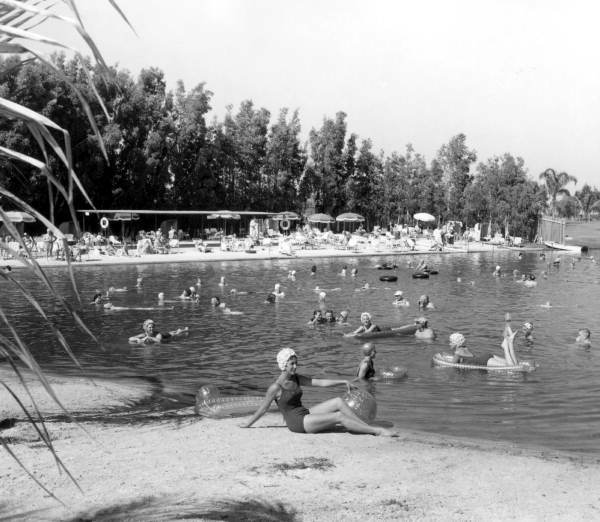 North Port doesn’t want any of that; they just want to focus on the springs and the park that exists there now. Each side has offered to buy the other out. Neither will sell. The lease with the current operator is scheduled to end this month. 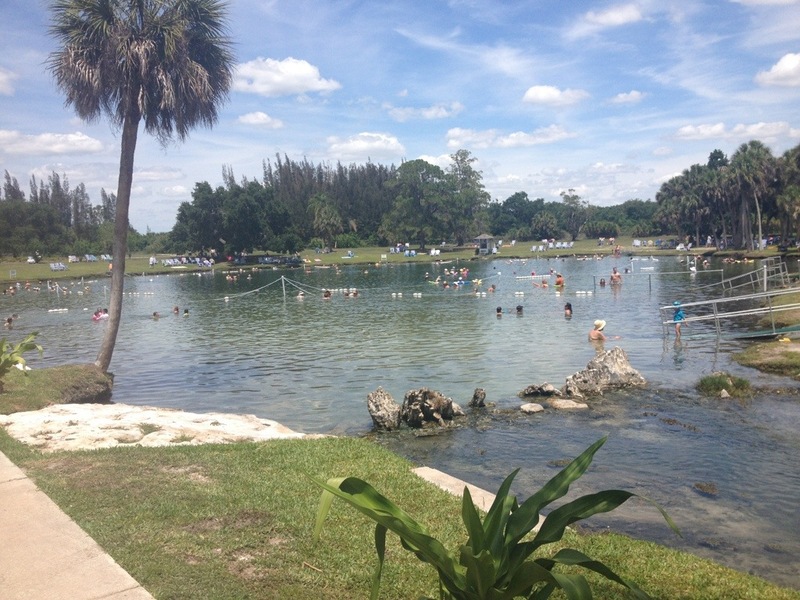 If it isn’t extended, the springs will close until the government agencies come to terms over its operation. Alas, Dear Fiancee didn’t enjoy the gobs of vegetation that floated on the surface and retreated to her seat in the sun. But, overall, she enjoyed the peaceful setting and even alluded to a return trip. 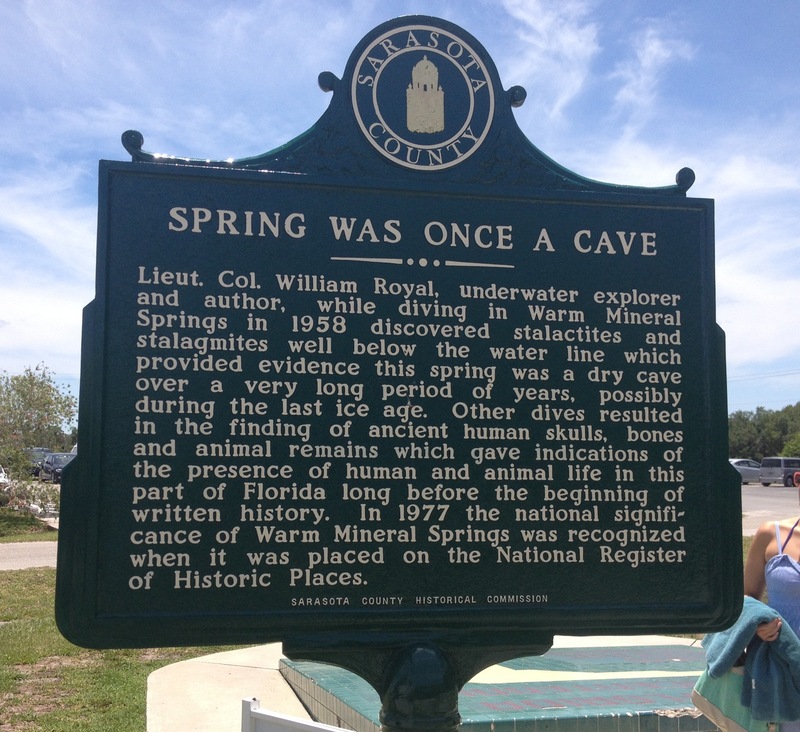 Later that night, I read about William Royal, an amateur archaeologist responsible for bringing attention to the springs’ archaeological wonders in the 1950s and 1960s, and an encounter he had with an alligator during one of his dives. 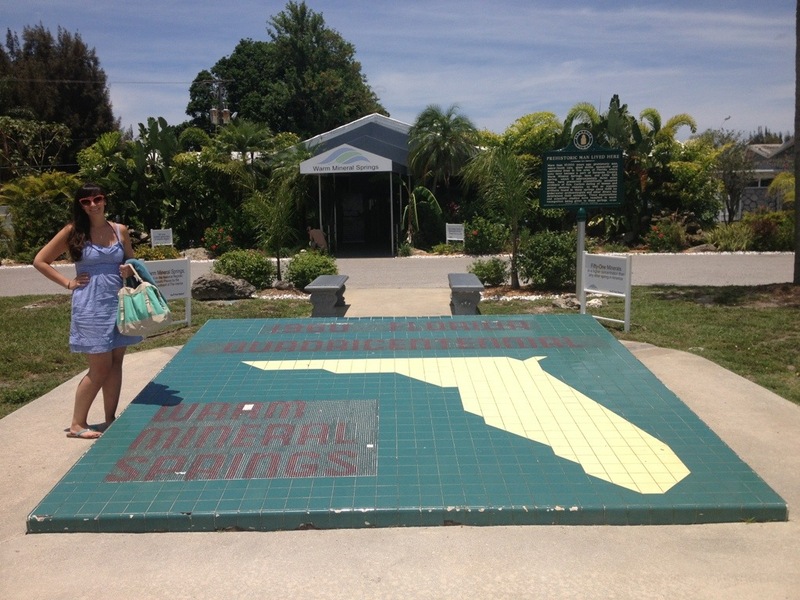 “Oh, there have been alligators in Warm Mineral Springs,” I said to Dear Financee. “I’m never going back,” she said. 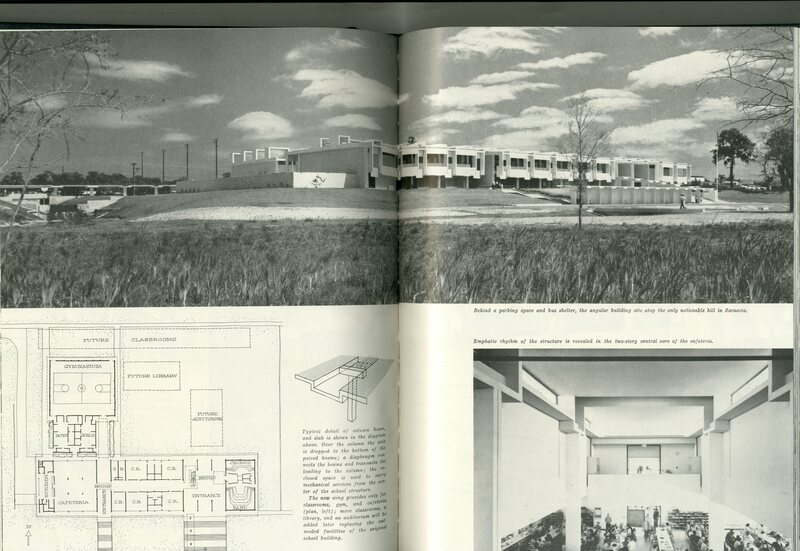 Below are old photos of WMS. See Visual Ephemera’s post for more photos and this website for more information about the springs. 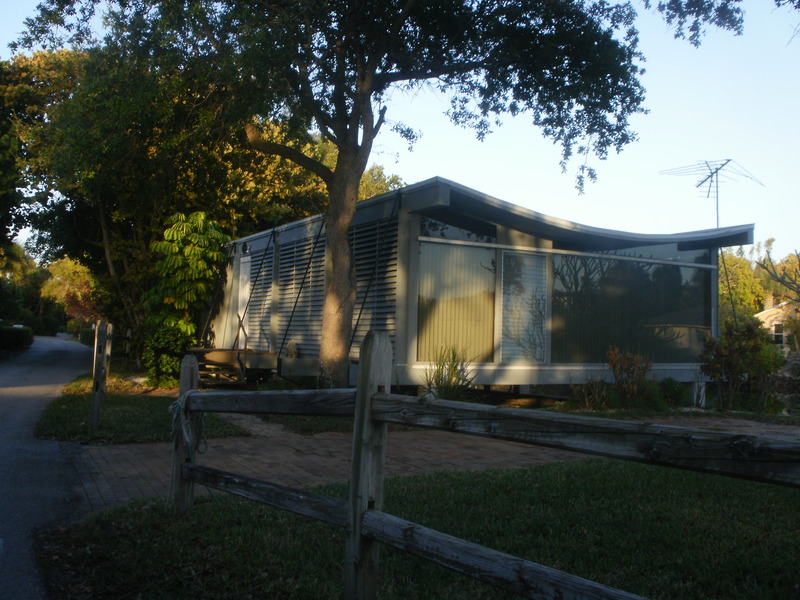 The Paul Rudolph-designed classroom addition with breezeway at Sarasota High School. Too often preservationists become so enamored by a building’s architect, they overlook its shortcomings. 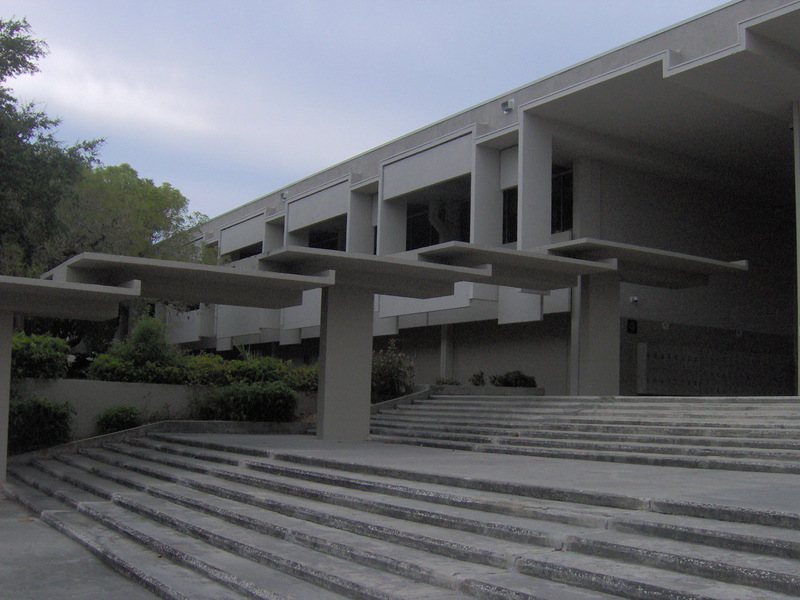 I fear this is occurring with the two Sarasota High School buildings designed by Modernist architect Paul Rudolph. 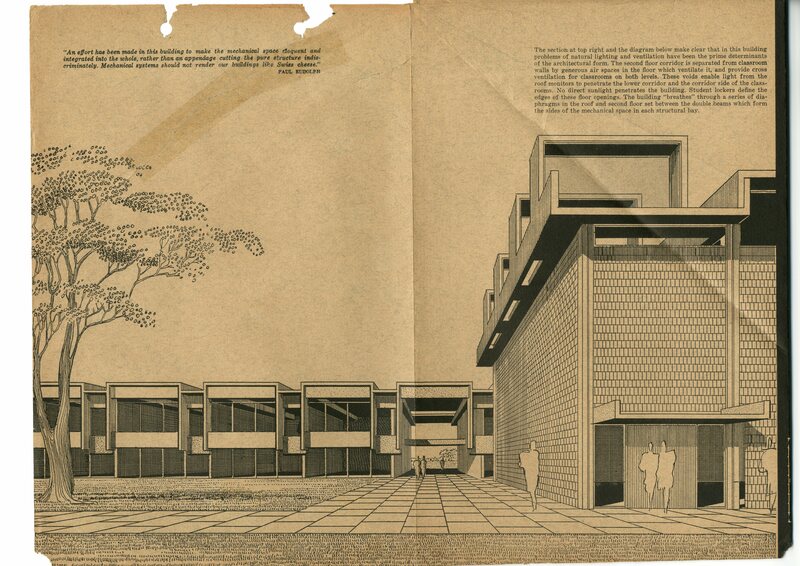 Early this month, the Sarasota County School District revealed its plans for the two Rudolph-designed buildings on the SHS campus, and preservationists are not happy. The gym is too small, district officials say, and must be torn down. They don’t want to demolish the classroom building addition, but they do want to gut its rooms and enclose its two-story breezeway and use it as a media center. 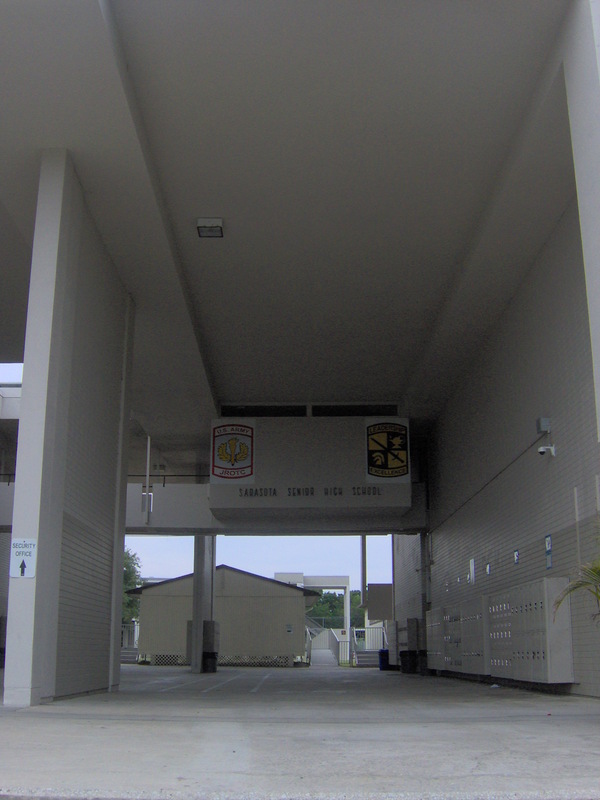 The school district employees seeking the renovations at Sarasota High are the same who successfully pushed for the demolition of a deteriorated Riverview High School, another Rudolph project, in 2009. That preservation effort drew international attention as advocates futilely sought to raise money and gain support to rehabilitate the Rudolph buildings and leave enough room on the school’s cramped property for a new campus. 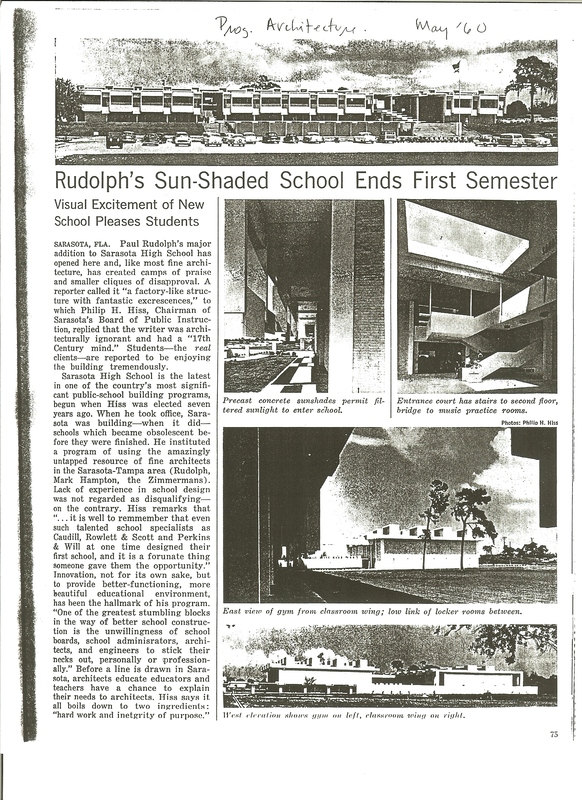 As I wrote about in my thesis, preservationists in the Riverview case invoked Rudolph so often, they turned off many citizens who couldn’t have cared less about the designer–they just wanted a functioning school at a reasonable price. By the time they developed a plan to rehabilitate the buildings, they were too far behind to stop the momentum. 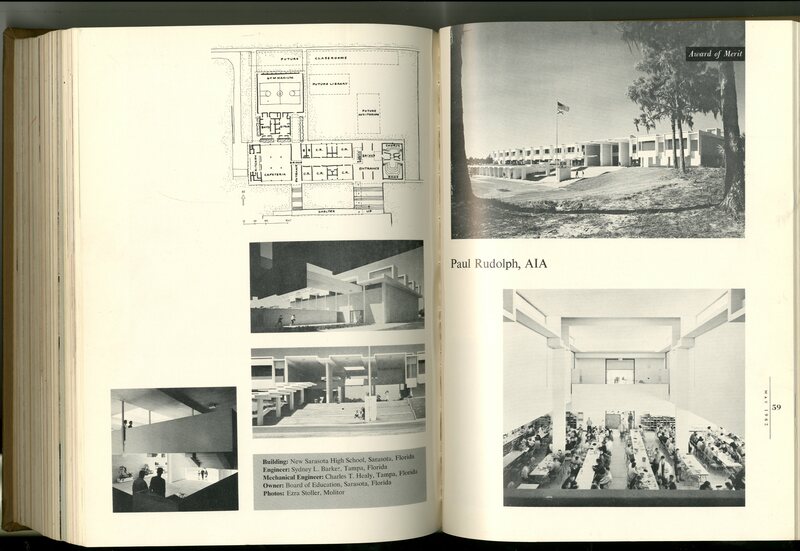 As the following period journal articles attest, Sarasota High School received a lot of attention from the architectural press and marked a turning point in Rudolph’s career. Rudolph’s work at SHS received a different reaction from people who actually utilized it. 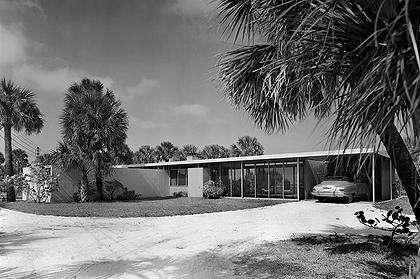 Opened in 1960 on the heels of Riverview High School, the buildings were considered too progressive for Sarasotans and signaled the downfall of the Sarasota School of Architecture. Their steep price didn’t make the endeavors more digestible, nor did the the structural problems that arose shortly into the SHS classroom building’s tenure. Then there was the structures’ lack of functionality. 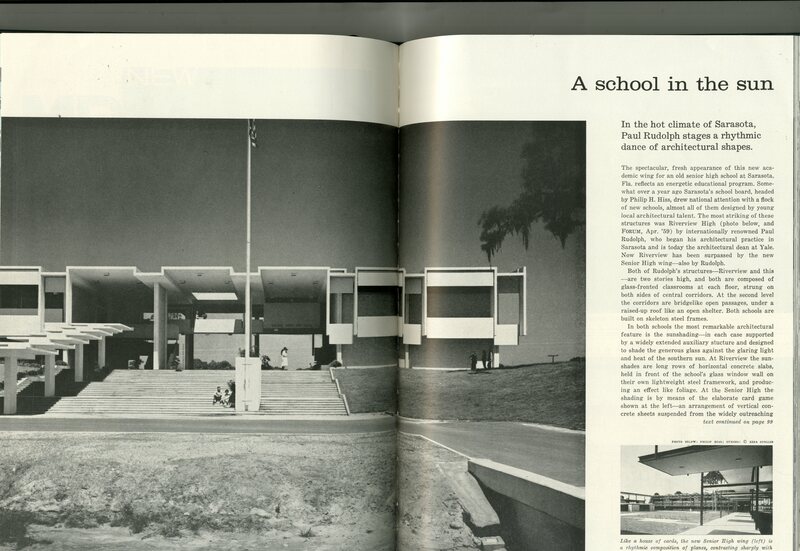 I attended Sarasota High and don’t remember the Rudolph-designed classroom building fondly. 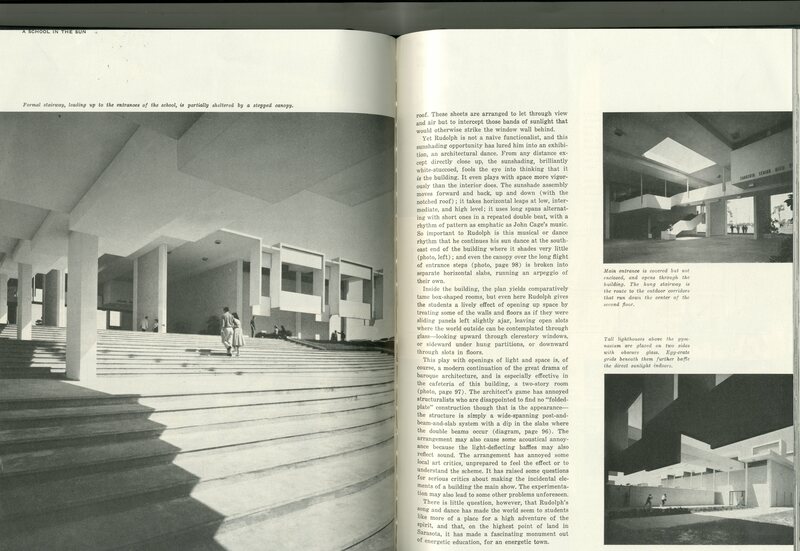 All concrete, it had slightly more charm than a parking garage, and sound seeped into classrooms from the hallway and neighboring rooms. 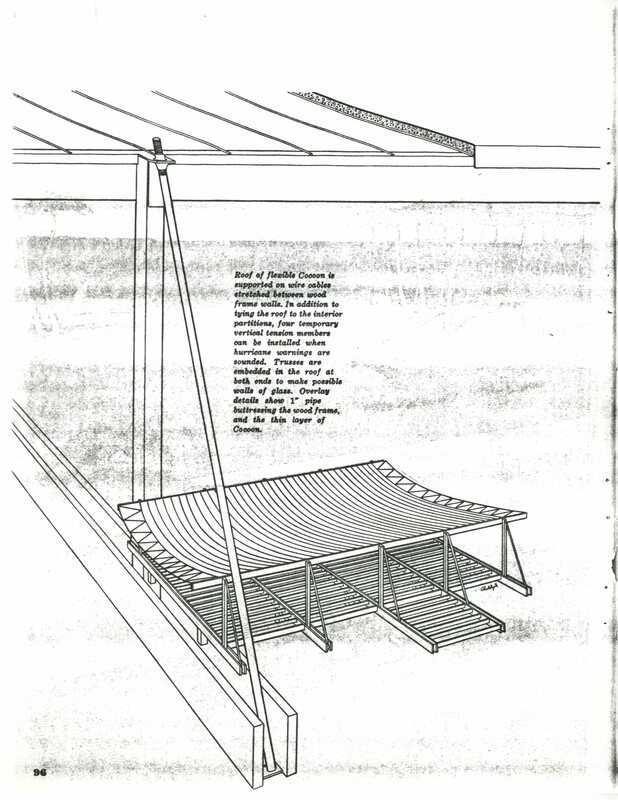 And I never understood the reason for the breezeway’s roof cutout, which allowed rain to pour into an otherwise sheltered space. 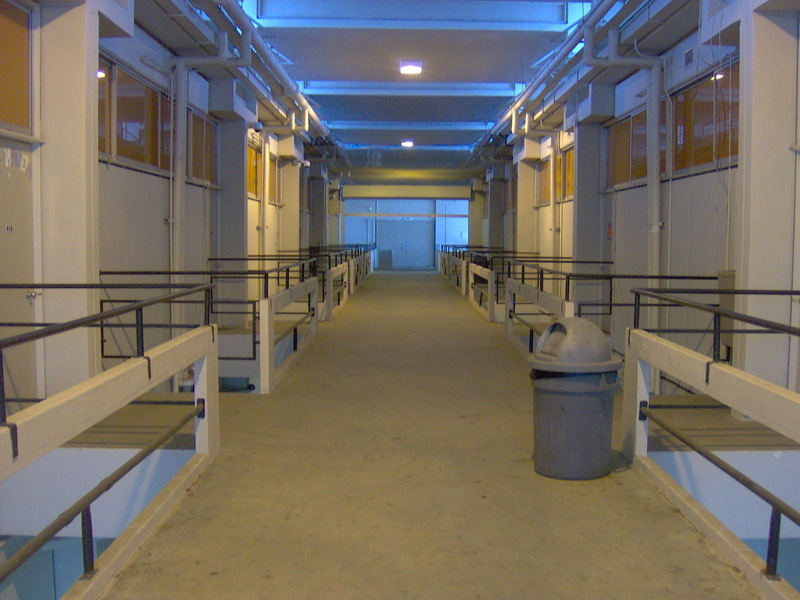 The large breezeway also makes it difficult to control access in and out of the school–not ideal in a post-Columbine world. 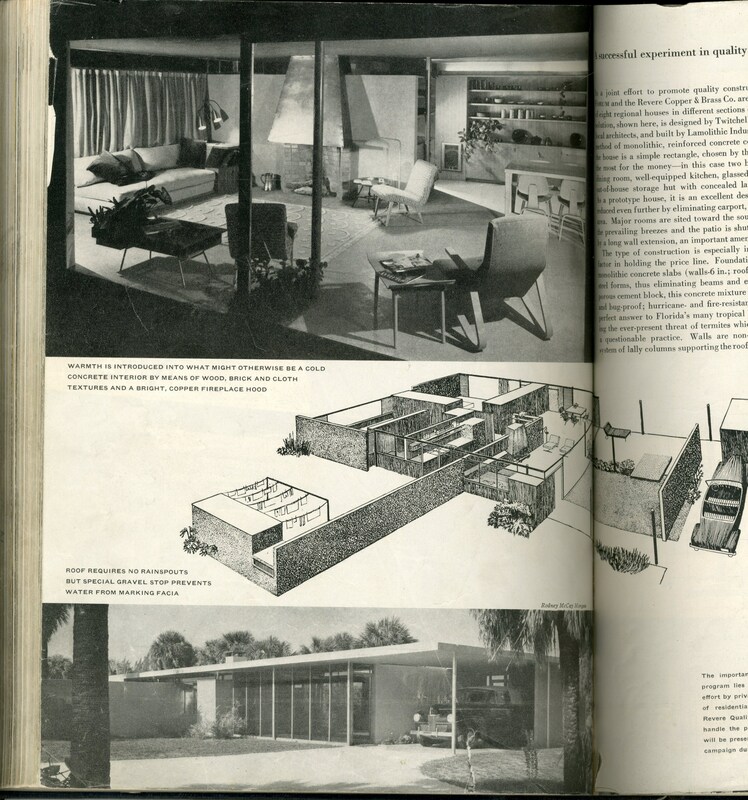 On March 14, I went to the Sarasota Architectural Foundation’s discussion “Sarasota High School: Paul Rudolph’s Legacy” at the Ringling College of Art and Design. 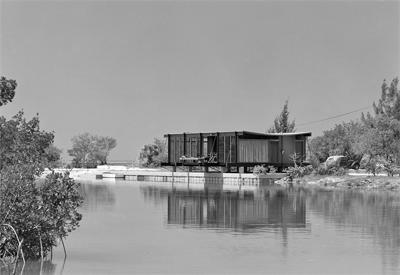 With few exceptions, the event was attended by the foremost proponents of Sarasota School of Architecture preservation. Surprisingly, some of the school district’s facilities management personnel were seated near the front, a good sign that they were open to the preservationists’ ideas. But I don’t think what they heard will change their minds. Instead of making a case for preservation to which everyone could relate, a majority of the panelists summoned Rudolph’s legacy. This may have played well to the–mostly–partisan audience, but I guarantee the facilities management people didn’t care. 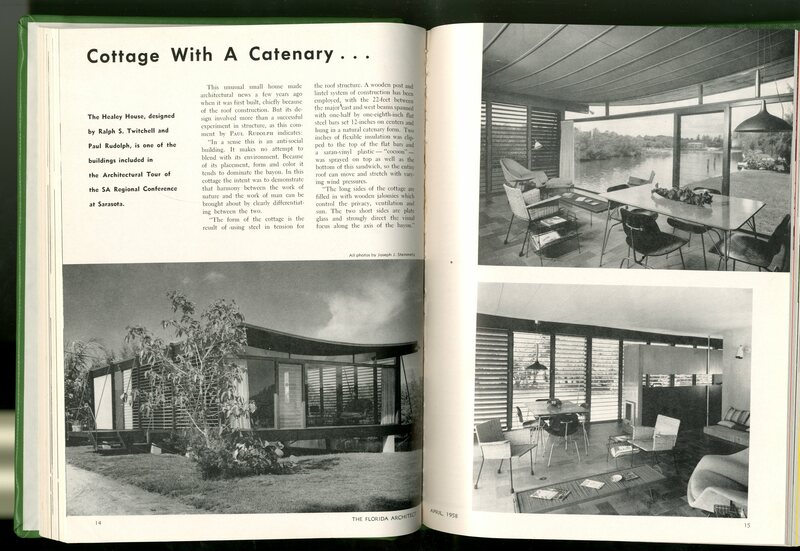 They think in terms of square footage and financial feasibility, not paying homage to dead architects. Same with the taxpayers and the SHS students and teachers who actually use the spaces. But that’s not to say the Rudolph buildings at SHS should be demolished or drastically altered. For the Rudolph buildings to survive, they must be changed. No matter who designed them, they just don’t function well, and, it could be argued, they never did. 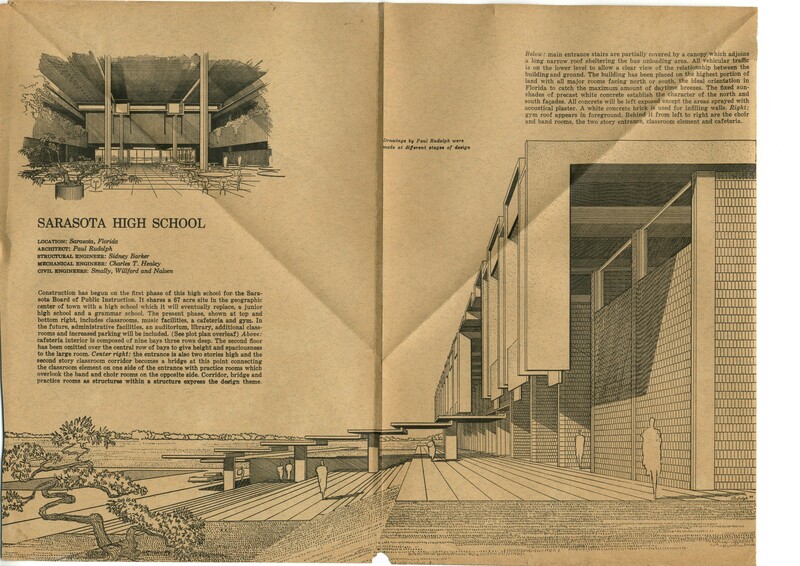 No one may end up completely happy, but there are potential adaptive reuses that could appease preservationists, district officials, and the school’s students and staff. Perhaps the classroom addition could be a component of the nearby original Sarasota High School building, which is being rehabilitated into an art museum. One panelist at the SAF event, architect Joyce Owens, suggested the gym become the media center rather than enclose the breezeway. The school district doesn’t want that to happen for reasons unknown, but those are the kinds of ideas preservationists should rally behind. Simply saying no to everything leads preservationists nowhere, but a reasonable plan that fits within its budget will be difficult for the school district to ignore. The Revere Quality House should be in a landfill right. When its former owners sought to sell in 2003, the house’s age, condition, lack of value, location, lack of square footage, and the size of the land it sat on all pointed toward demolition. 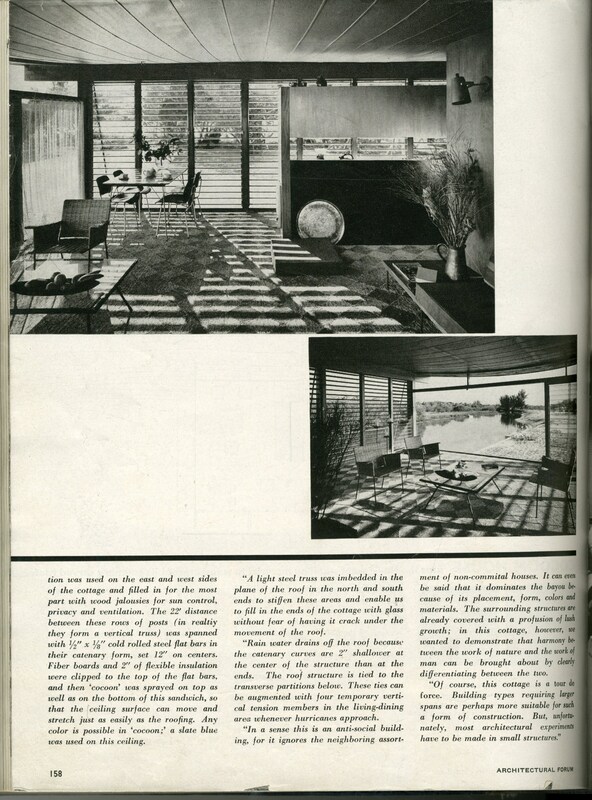 Fortunately, the Revere Quality House was not torn down. Instead, it was beautifully restored, and a larger residence with a similar design and material makeup was constructed next to it. 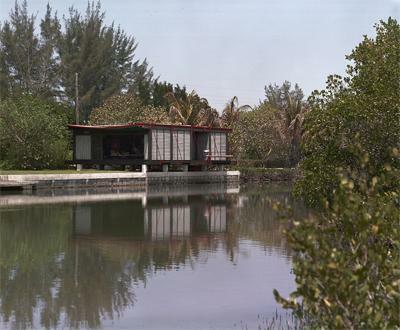 The Revere Quality House, built in 1948 on Siesta Key, was designed by Paul Rudolph and Ralph Twitchell–the fathers of the Sarasota School of Architecture. 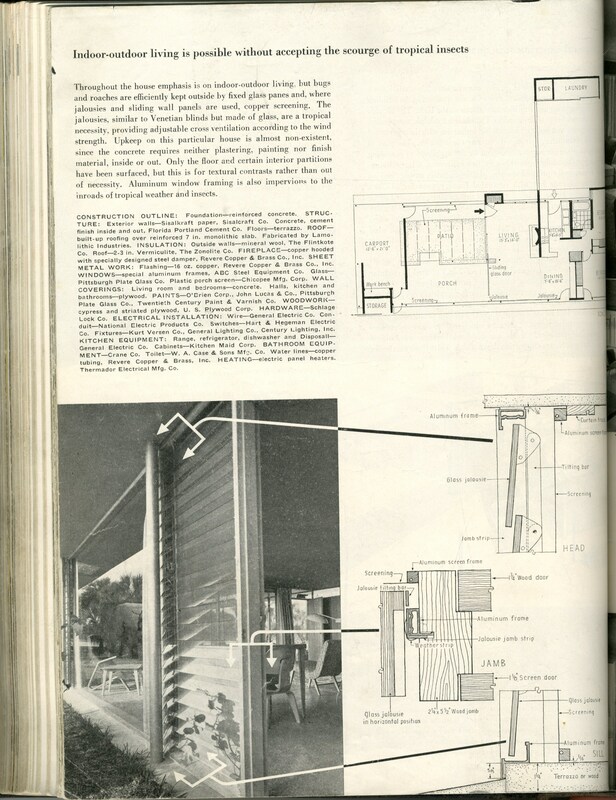 The house was a product of the Revere Quality House Institute, a housebuilding program sponsored by the Revere Copper and Brass Inc. and Architectural Forum magazine. 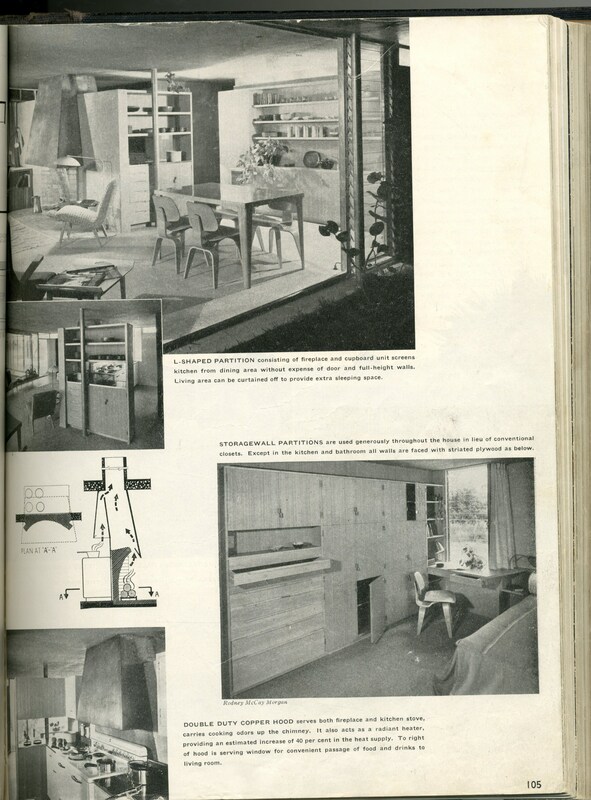 The program’s goal was to showcase innovative yet affordable housing to meet the needs of postwar America, and eight houses were built throughout the country. 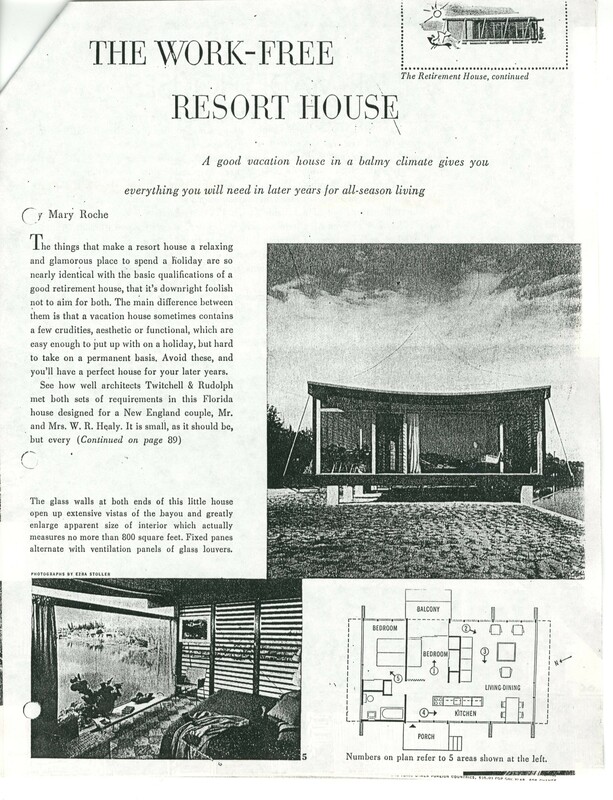 The Revere Quality House certainly met the program’s goals. 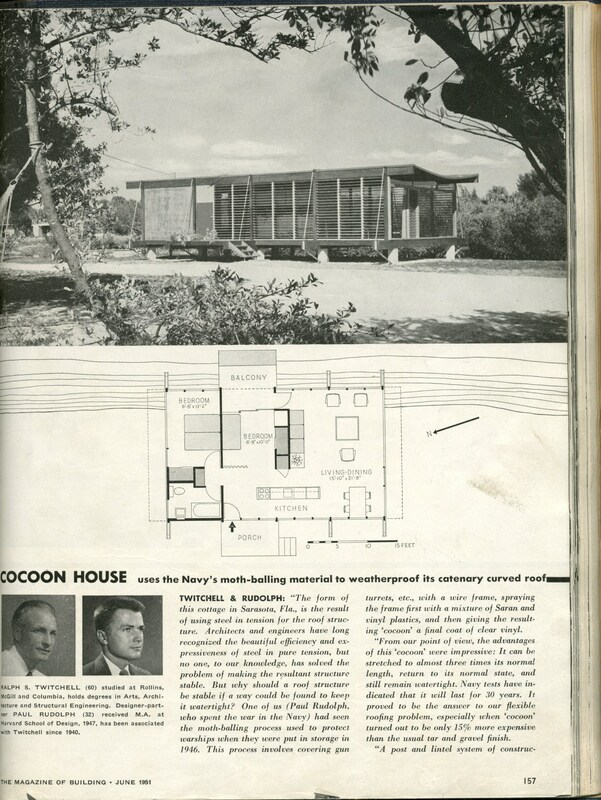 The about 1,ooo-square-foot house was built by Lamolithic Industries and utilized their state-of-the-art monolithic concrete construction system said to be resistant to mildew, bugs, fire, and hurricanes. 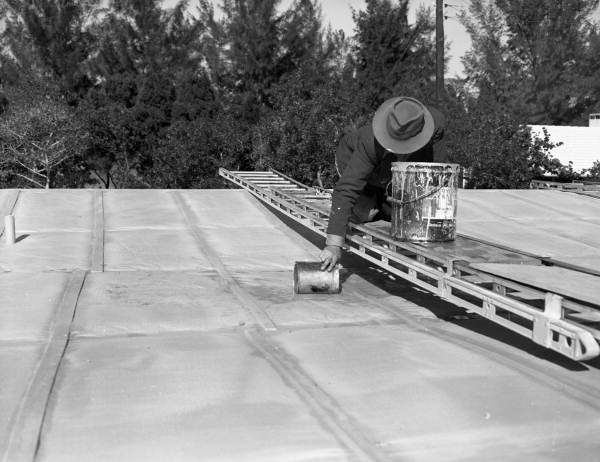 The concrete roof had a passive-cooling sprinkler system and was held up by a series of evenly placed lally columns. 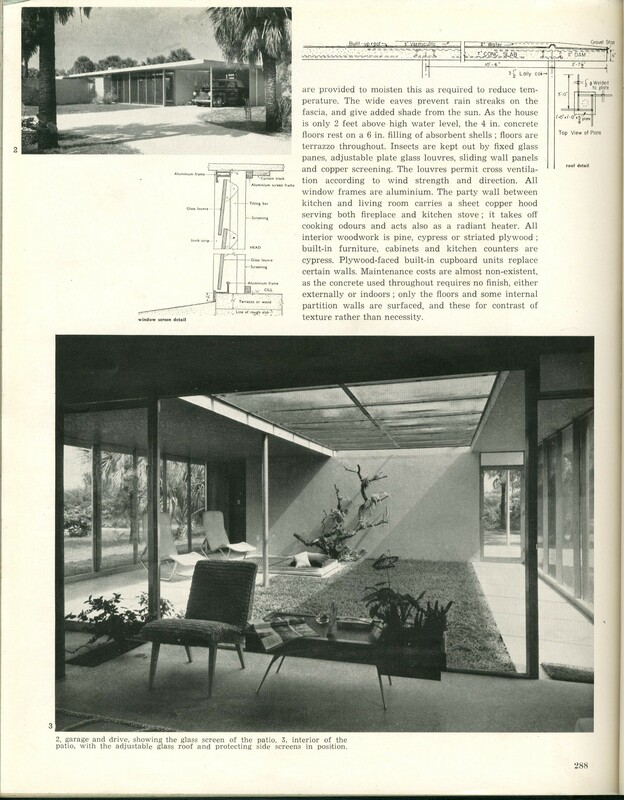 This roof structural system allowed for unlimited interior space configurations and walls of glass. 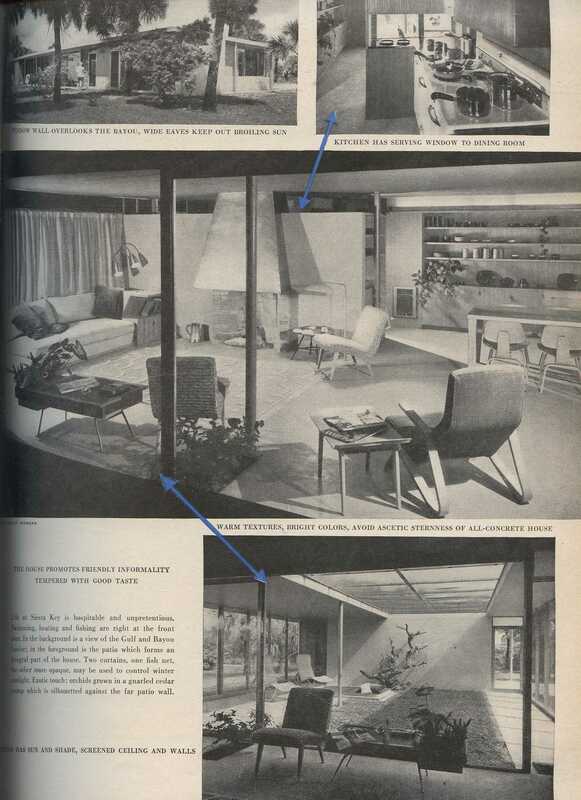 The rectangular house had a carport, patio with roof cut out, a living room, dining room, kitchen, two bedrooms, and laundry room that was set off from the house. 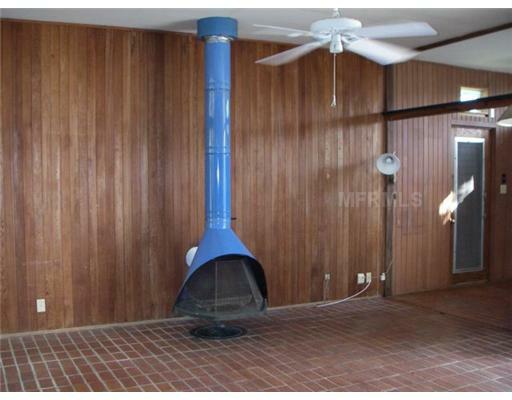 Architectural features included a copper stove hood and fireplace made by (who else) Revere Copper. 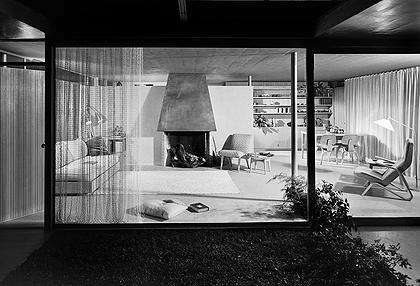 Photographed by Ezra Stoller. Courtesy ArtStor. As I wrote about in my thesis, the house was quite the sensation after it was built as an estimated 16,000 people toured it. 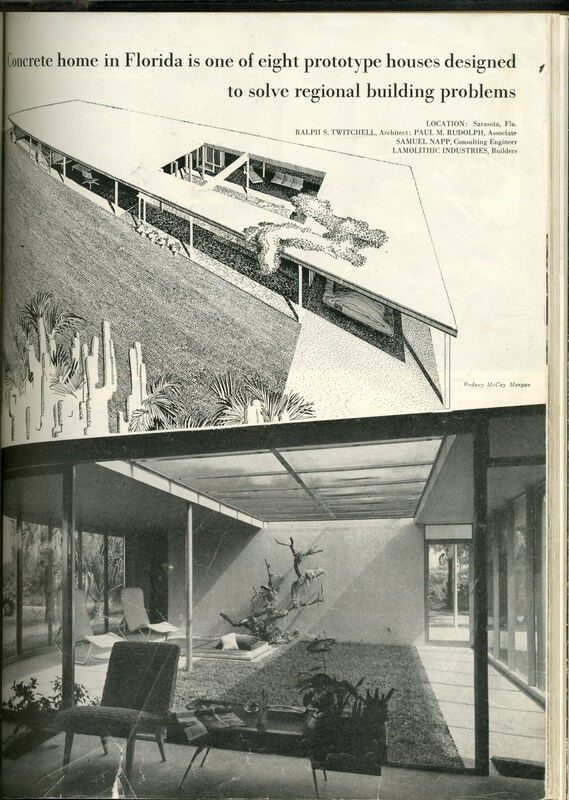 Furthermore, it was published in architectural periodicals throughout the world and brought much attention to Rudolph and Twitchell’s subtropical take on the International Style. 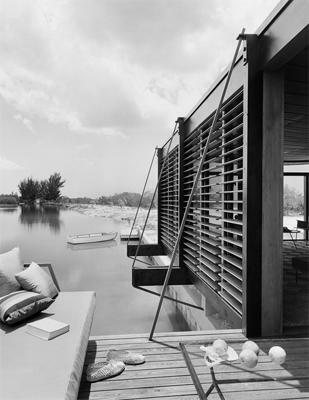 The house was designed for Roberta Finney, and Twitchell liked his client so much he left his family and took up residence with her. 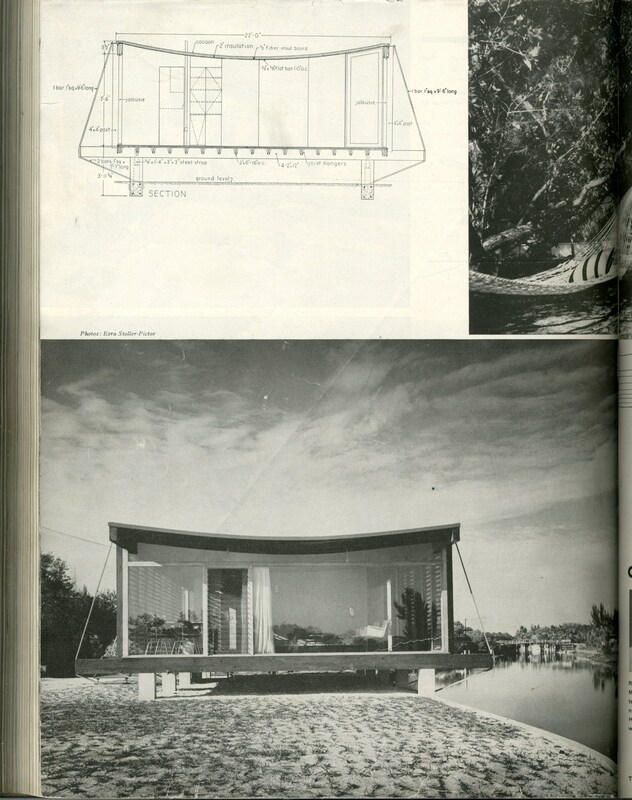 (The Cocoon House was designed a few years later for her parents.) 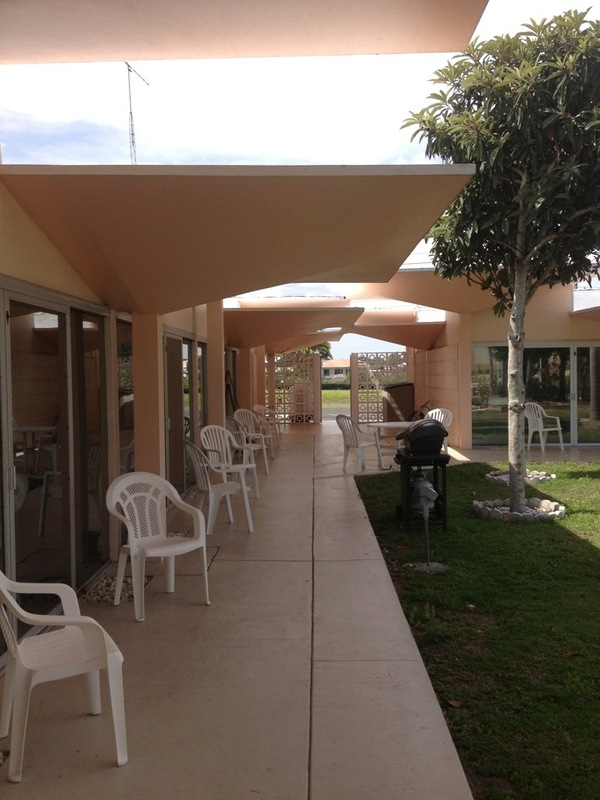 To meet the Twitchell/Finney family’s needs, the patio and carport were enclosed and a carport/guest house was built on the property. 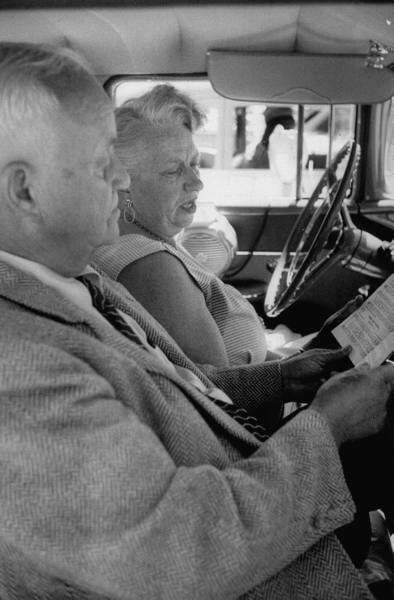 Roberta Finney died in 1966, and Twitchell remarried a third time and remained in the house until he died in 1978. His family continued to live there after his death. 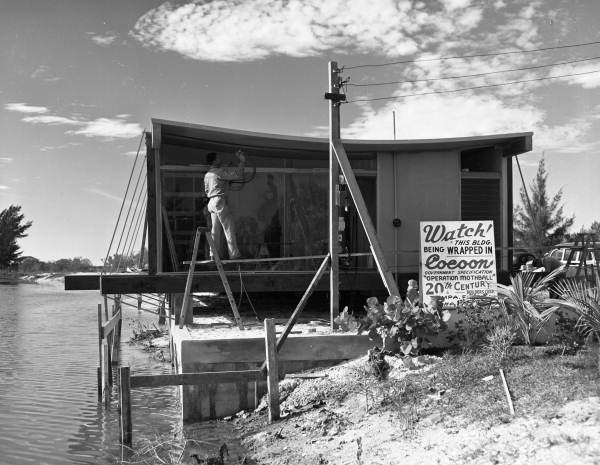 Siesta Key in 2003 was hardly recognizable from Siesta Key in 1948. 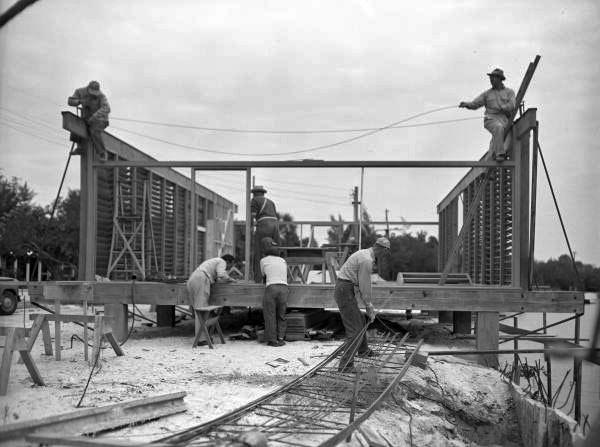 By that time, the island’s population had swelled, and a majority of the original houses on the island had been razed in favor of condos and monster Mediterranean Revival (Revival) mansions. Land values and property taxes soared, which forced many longtime Siesta Key residents to sell to developers. Twitchell’s descendants found themselves in just such a predicament. 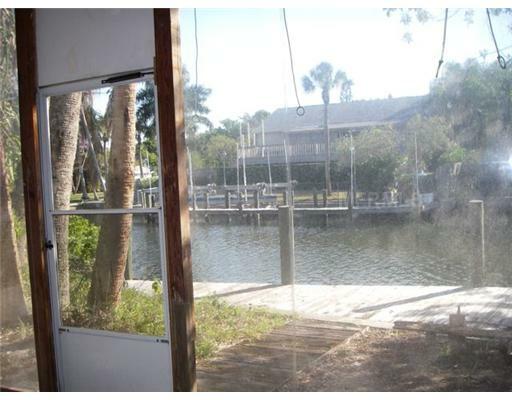 They had a crumbling, 53-year-old house on nearly an acre of land–huge for the north end of Siesta Key–with boat access to the Gulf of Mexico, just a couple hundred feet away. In other words, it was a developer’s dream. But that’s when Doug Olson stepped up. He already lived in a Sarasota School house, so he recognized the Revere Quality House’s importance when he bought it from Twitchell’s descendants in 2003. 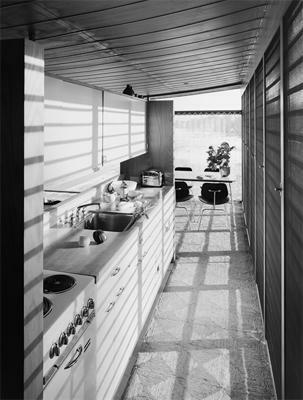 His goal was to restore the house and construct an addition, but Olson realized he could not undertake the project alone and teamed up with–ironically–a developer, Howard Rooks. 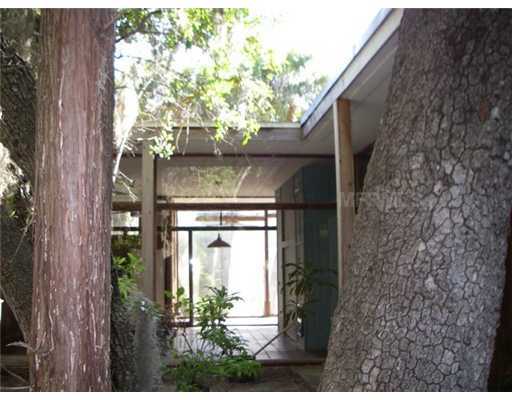 Rooks asked Sarasota-based Modernist architect Guy Peterson for his opinion on the property, and Peterson came up with the plan to both restore the tiny Revere Quality House and build a new residence on the property. 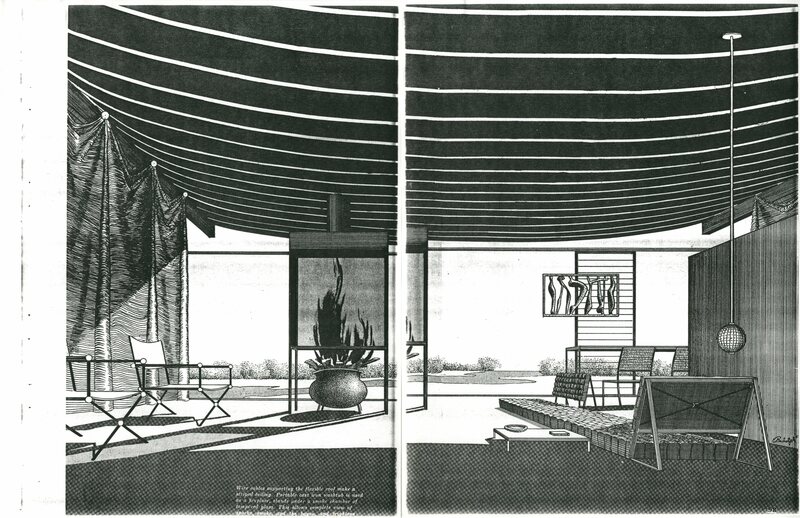 Peterson drew up plans for a 4,712-square-foot, three-story house that paid homage to the Revere Quality House with its design, colors, and materials. 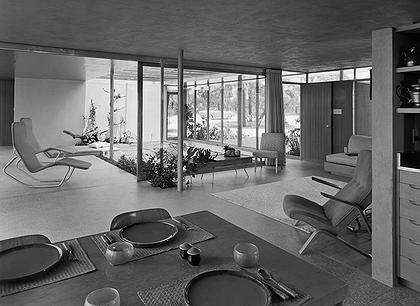 Then the Revere Quality House was restored nearly to its 1948 appearance, down to the paint colors. Furthermore, a pool was dug behind the historic dwelling so it could serve as a guest house/pool house for the new, much larger and taller main residence. The restored Revere Quality House, right, and the new main residence. Courtesy of Guy Peterson OFA. In April 2007, the completed project was on the market for $4,875,000, but Sarasota was so slammed by the real estate crash that it sat for more than four years. 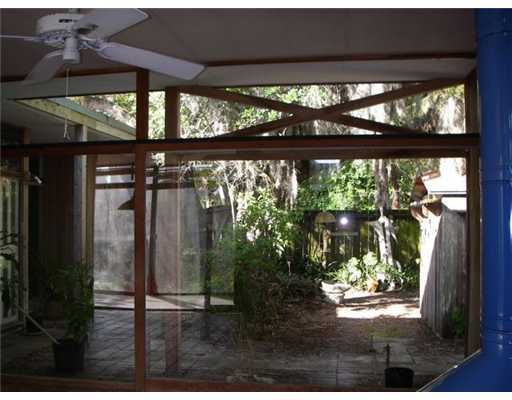 According to the Sarasota County Property Appraiser, the house finally sold for $2.1 million on August 31, 2011. From a preservation point of view, I consider the Revere Quality House project to be a success overall. 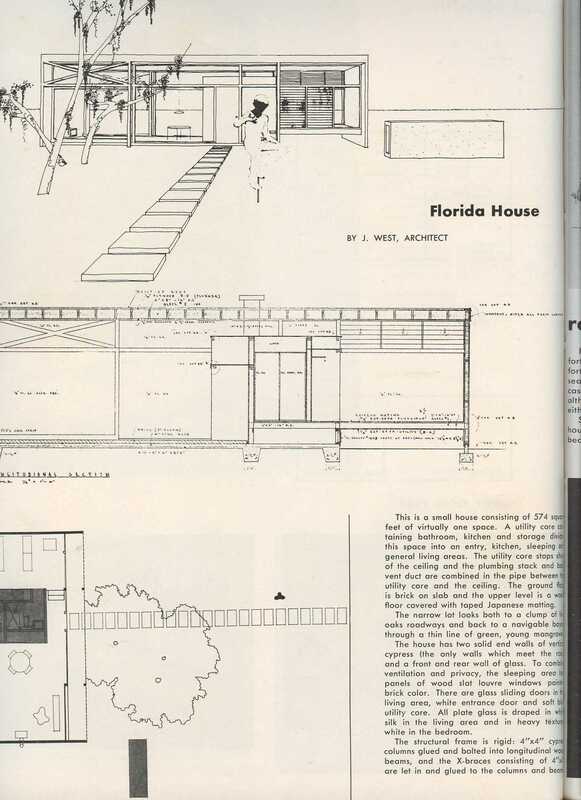 The building rests on a highly desirable land and it could have very easily been razed like so many other Sarasota School houses in favor of a soulless mega-mansion. Instead, the Revere was meticulously restored and a fairly compatible new primary residence was built next to it. But from a financial point of view, the project was a failure. The developers of the project lost millions, and others will be wary of undertaking similar projects in the future. 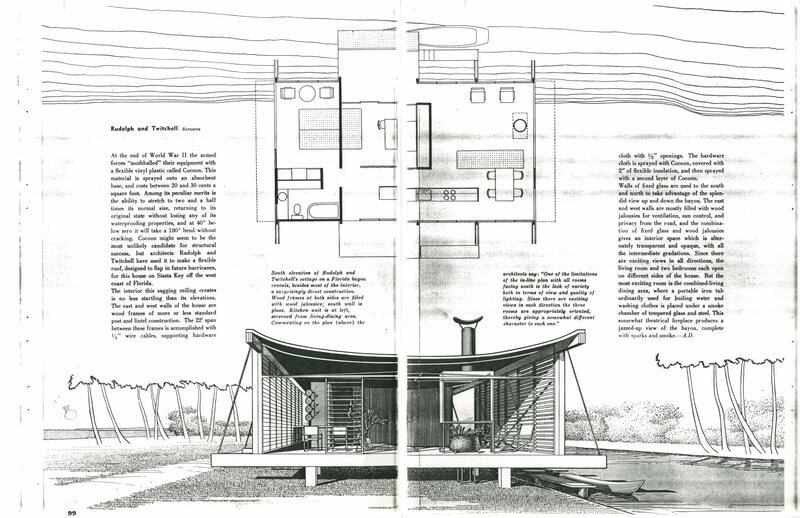 At least the Revere Quality House still stands as a reminder that even experimental modern buildings can be adapted to new uses as long as sympathetic people are involved. If only the numbers added up. 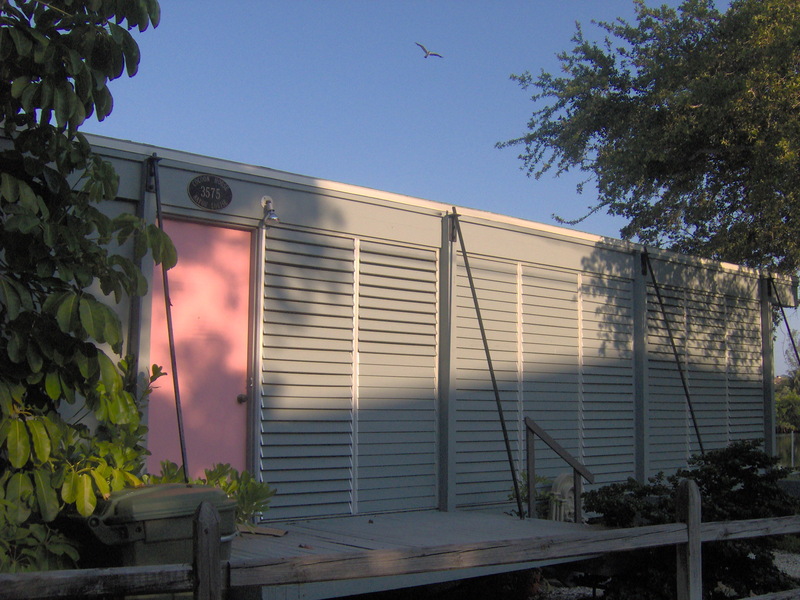 For my last entry of 2010, I think it’s only fitting I write about my most noteworthy historic preservation accomplishment this year: my thesis on the preservation of Sarasota School of Architecture buildings. 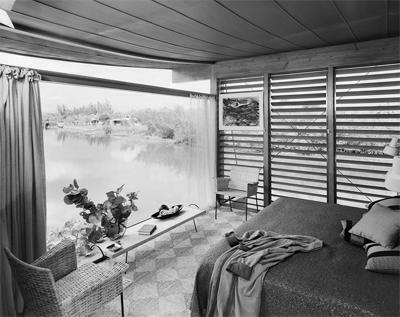 The SSOA was a group of similarly minded architects who originated in Sarasota, Florida, during the middle of the twentieth century. 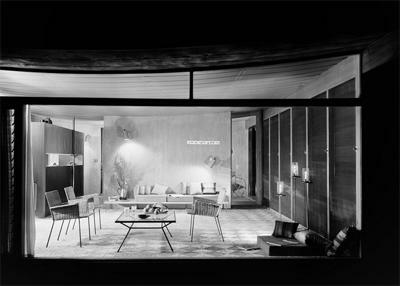 They designed in the modern style, and many of their works are on par with those being designed simultaneously in Los Angeles, Palm Springs, Miami, and New Canaan. 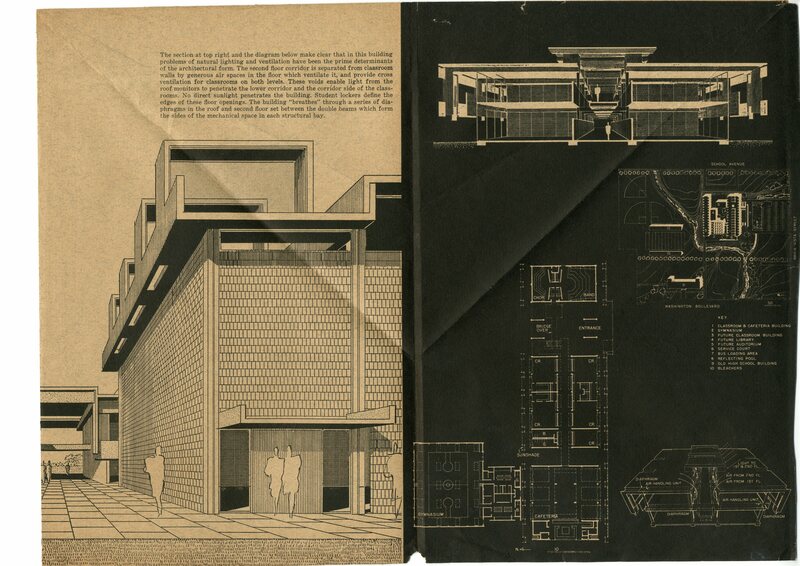 The movement waned in the 1960s and 1970s, and many SSOA buildings have been torn down. In the past couple decades, a preservation movement has sprung up to bring attention to these masterworks, but it’s struggling to gain hold in the community. I began research in fall 2009, but I did not really start my interviews and writing into January 2010. Despite a few bumps along the way, I successfully defended it to my committee and turned it in the University of Florida graduate office by the end of April. At 175 pages (including 40 photos) with about 200 sources, it was a great deal of work and I have the upmost respect for nonfiction writers. 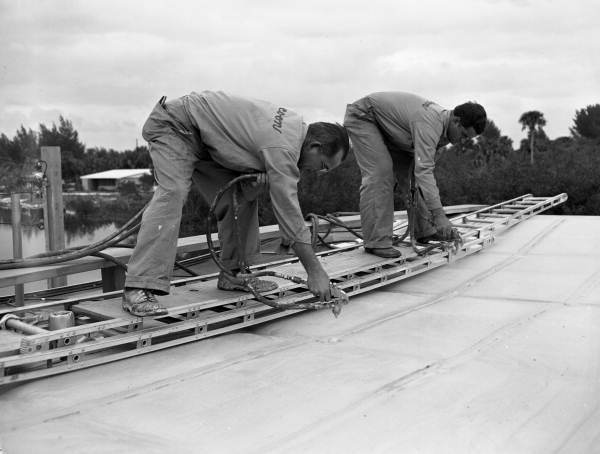 For the past few decades, there has been a movement in Sarasota, Florida, to preserve its mid-century modern buildings. 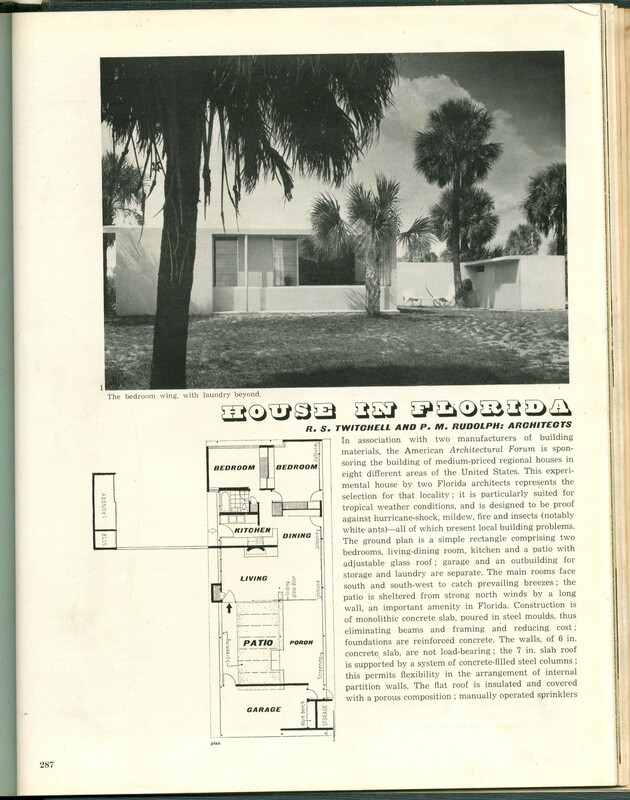 Known as the Sarasota School of Architecture, the development of this regional form of Modernism occurred as the small city was solidifying its reputation as a cultural capital after World War II. 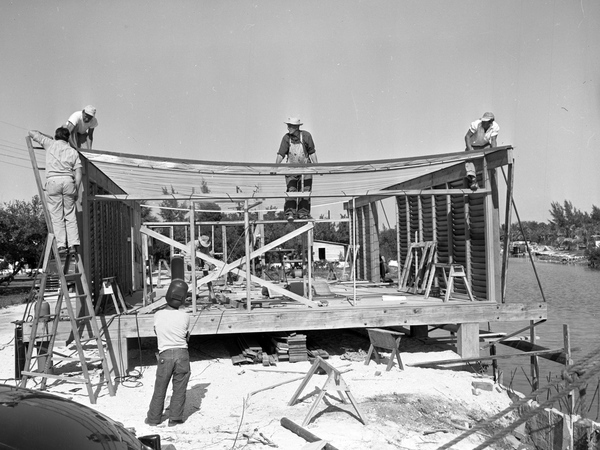 Members of the arts community included Sarasota School architects, who adapted modern architecture to the Florida Gulf Coast climate and environment by using native materials and climate-controlling design features. 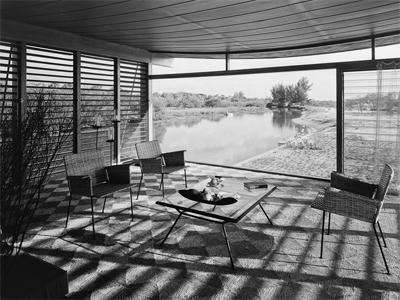 Their buildings received international praise and brought attention to the area, but the architects’ works never were fully embraced in Sarasota. 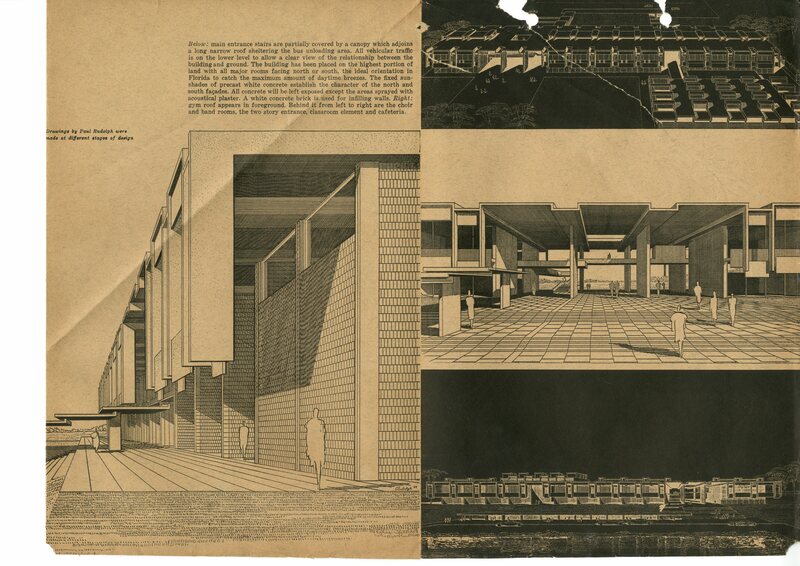 In the early 1960s, the city experienced political, economic, and cultural changes, and by the middle of the decade many top architects had departed. 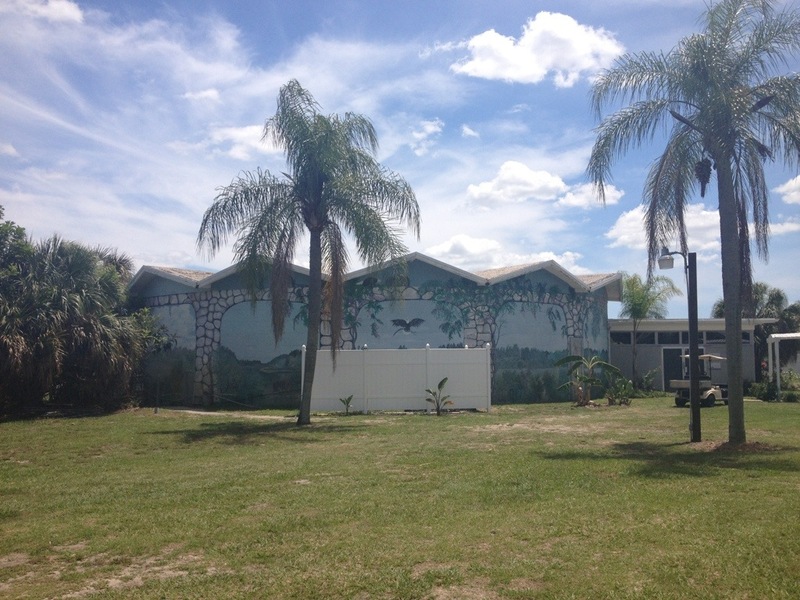 Over the years, high land values, changing architectural trends, and lack of public awareness — among other reasons — have led to the destruction of many Sarasota School structures. 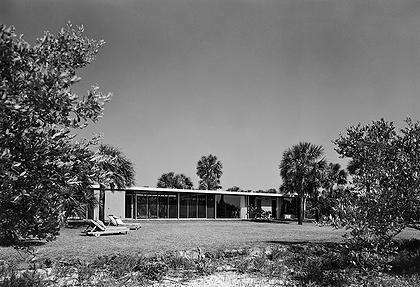 The 1995 release of The Sarasota School of Architecture, 1941-1966 by John Howey helped revive interest, and some buildings have been saved as a result. 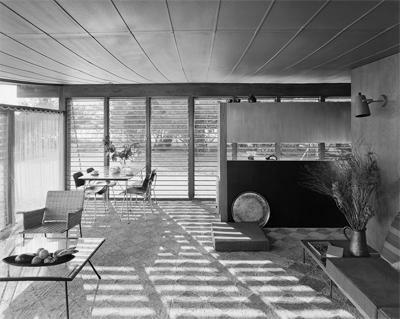 These preservation efforts have paralleled those in other communities with strong postwar Modernist legacies such as Los Angeles and Palm Springs, California; New Canaan, Connecticut; and Miami, Florida. 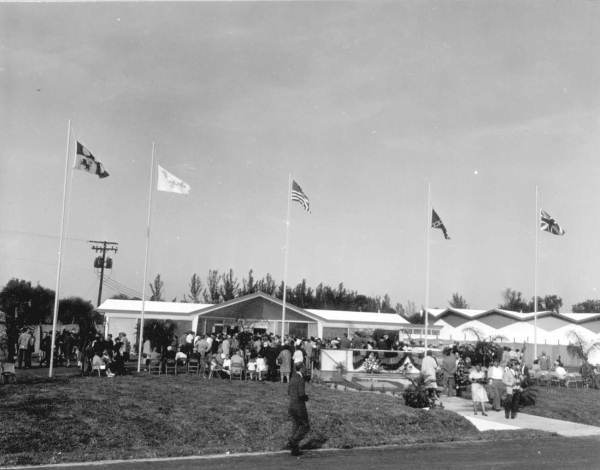 However, Sarasota continues to lose some of its best examples, as evidenced by the demolition of Riverview High School (1958) in 2009 after a high-profile preservation campaign. 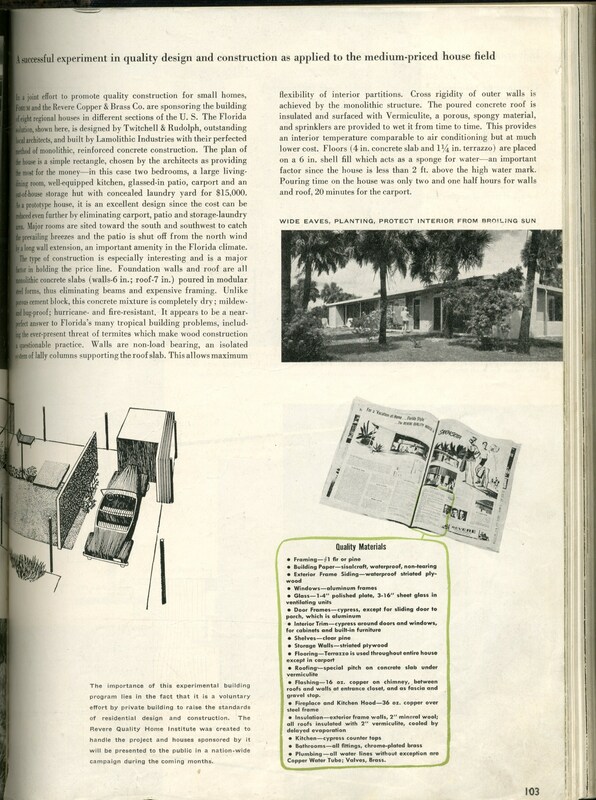 By utilizing books, articles, letters, Web sites, and interviews, this thesis is among the first studies of Sarasota School preservation efforts. 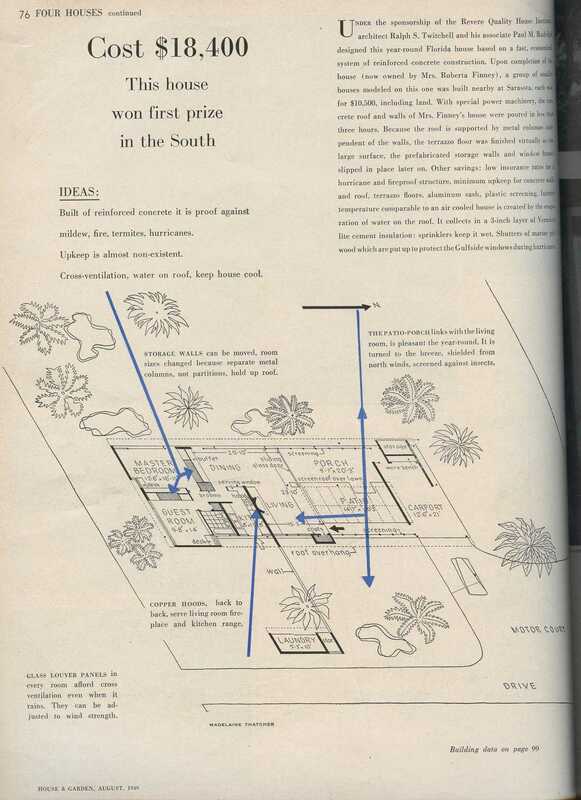 Case study analysis on Riverview High School and two buildings that have been saved — Revere Quality House (1948) and Nokomis Beach Plaza (1956) — revealed the common factors of land, location, economics, decision-making process, perceived obsolescence, and public education and awareness. 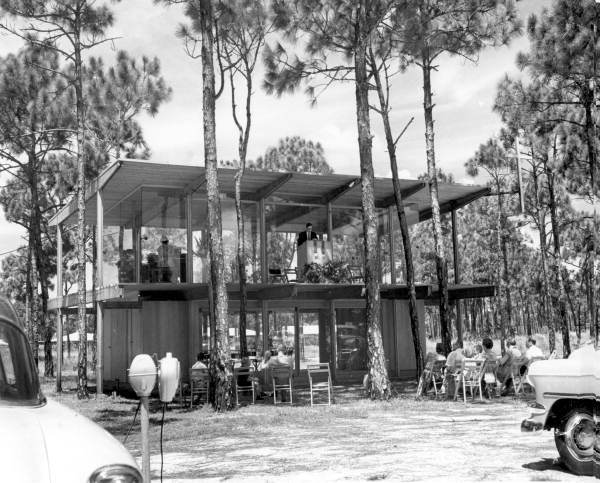 It is hoped the lessons learned from these three sites can be helpful in future mid-century modern preservation efforts in Sarasota and elsewhere. There are two things Americans are known for: cars and religion. 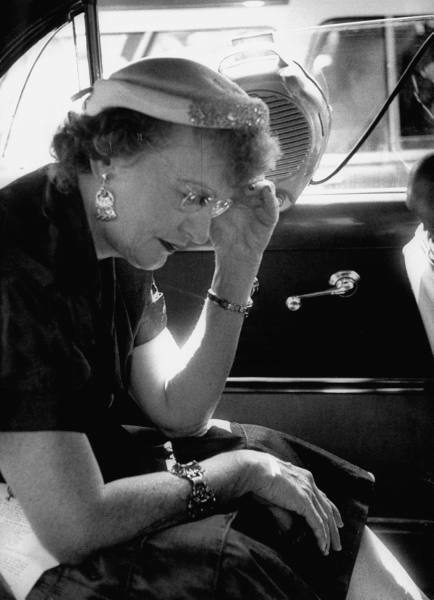 Combine the two and you have a classic “Life” magazine photo spread from the April 15, 1955, issue. 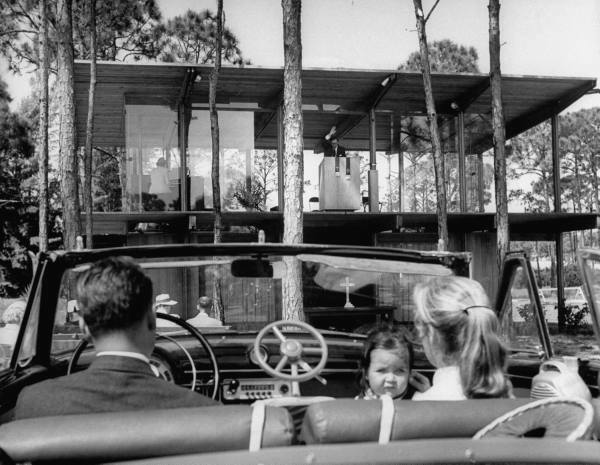 But what really distinguished the Venice Presbyterian Drive-In Church was its Miesian platform building designed by Victor Lundy. 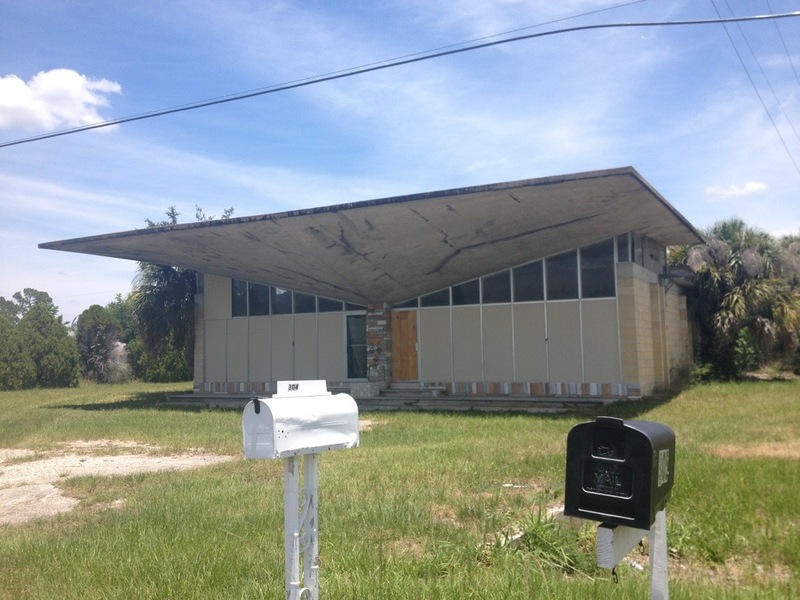 I’ve uncovered a lot of unique buildings while doing research for my thesis on Sarasota School of Architecture preservation efforts, but I think the drive-in church is the most special. 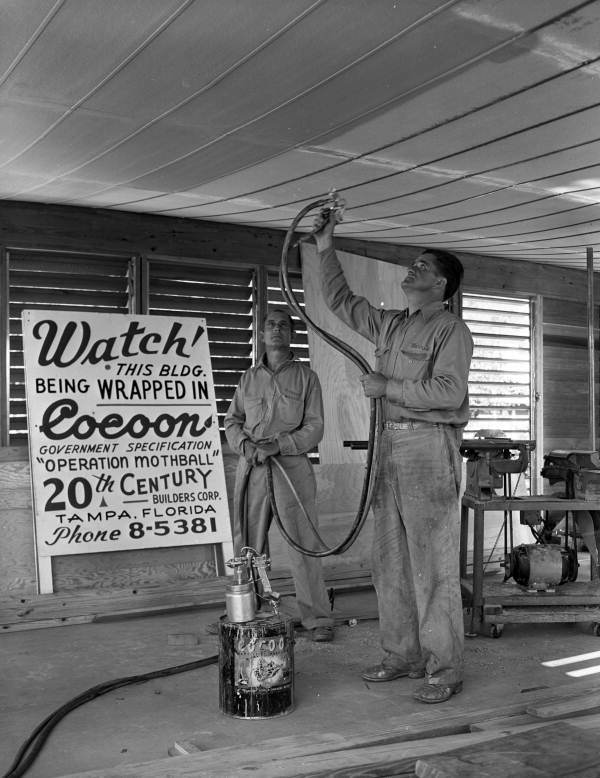 It was Lundy’s first commission after he moved to Sarasota in 1954. 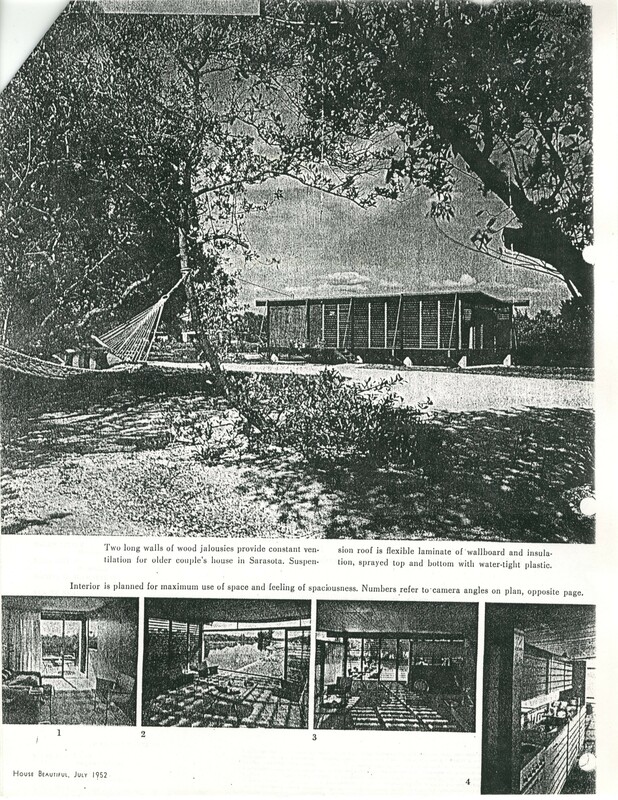 The two-story structure was set on an 8.5 acre site among pine trees. Lundy was careful to not have any trees knocked down. The flat-roofed structure cost $7,600 to build and it served as a pulpit and place for the choir, organ, and Sunday school classes. Apparently other churches took notice of Lundy’s work because he went on to receive many church commissions in his career, including a more traditional sanctuary for Venice Presbyterian. 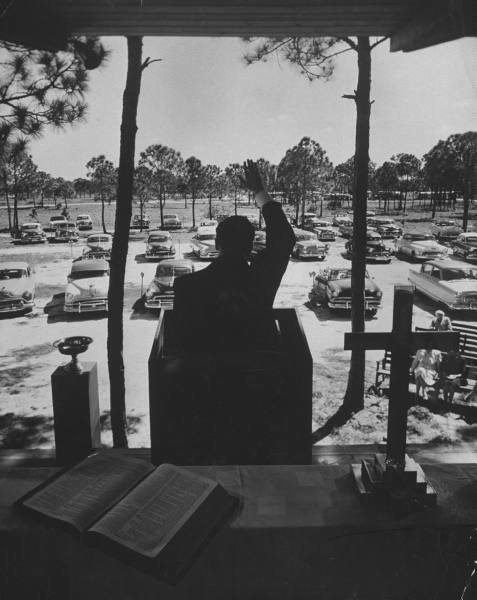 Unfortunately, the drive-in church fad fizzled out and the glass box in the pines was torn down. But the photos are too entertaining not to post. 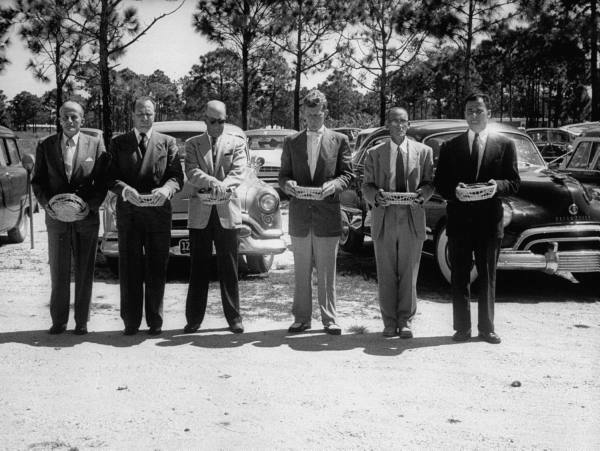 Courtesy of the Florida Photographic Archives.